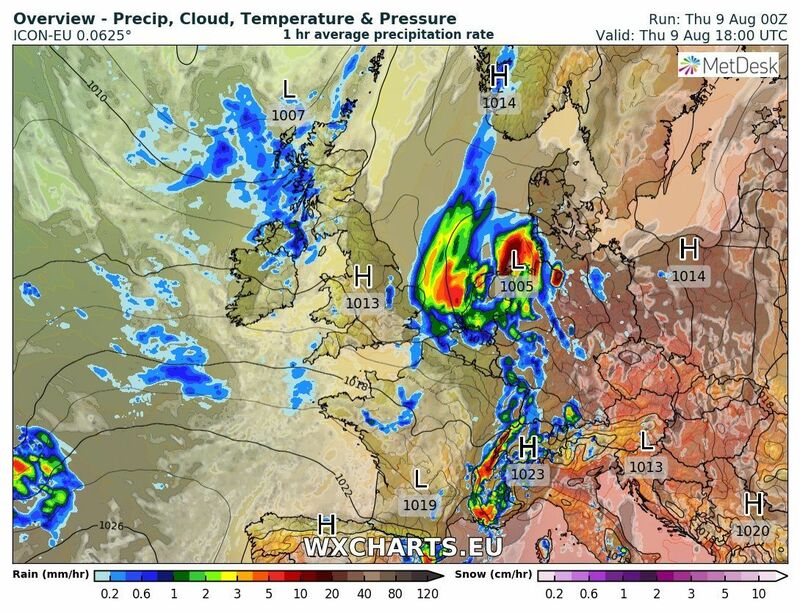 The Icon appears to be taking the wave on the elongated front associated with the low pressure over Norway a tad further west on Thursday than this morning's fax chart. 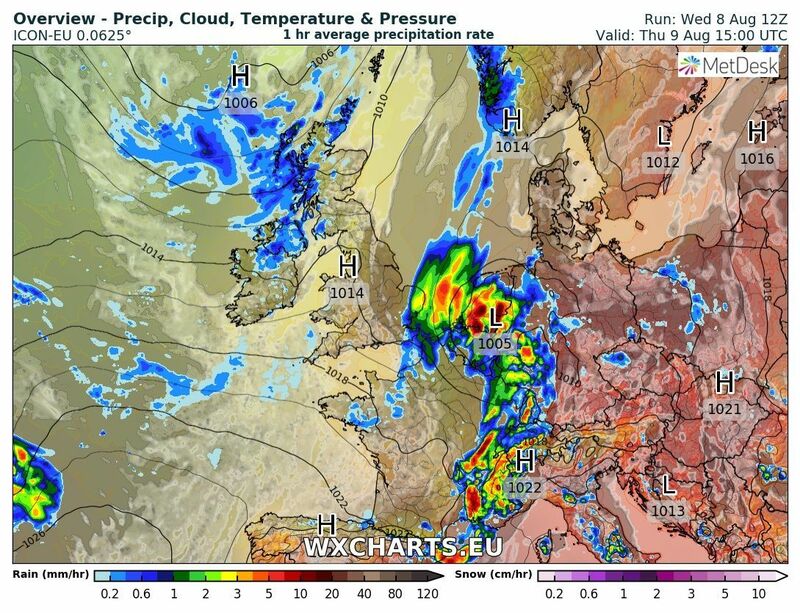 Need to await this evening's update. 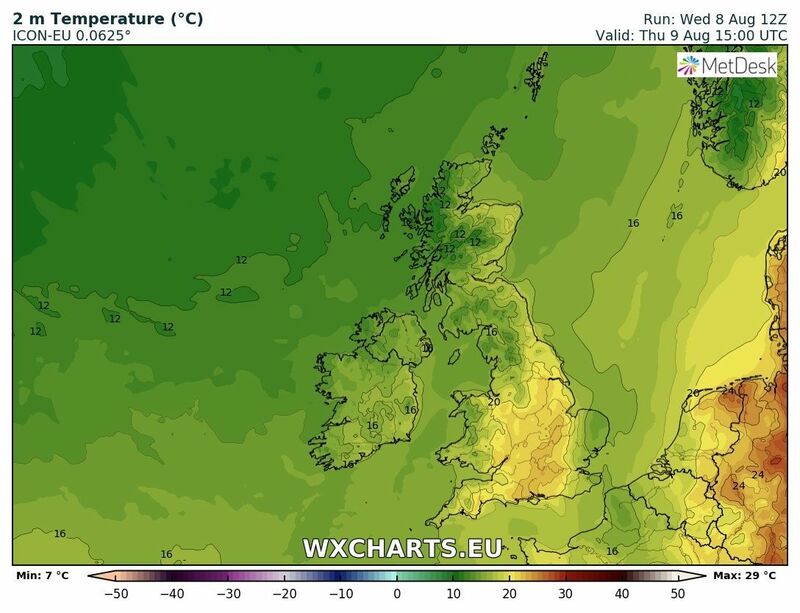 Outlook - changeable and generally cooler than it's been of late. 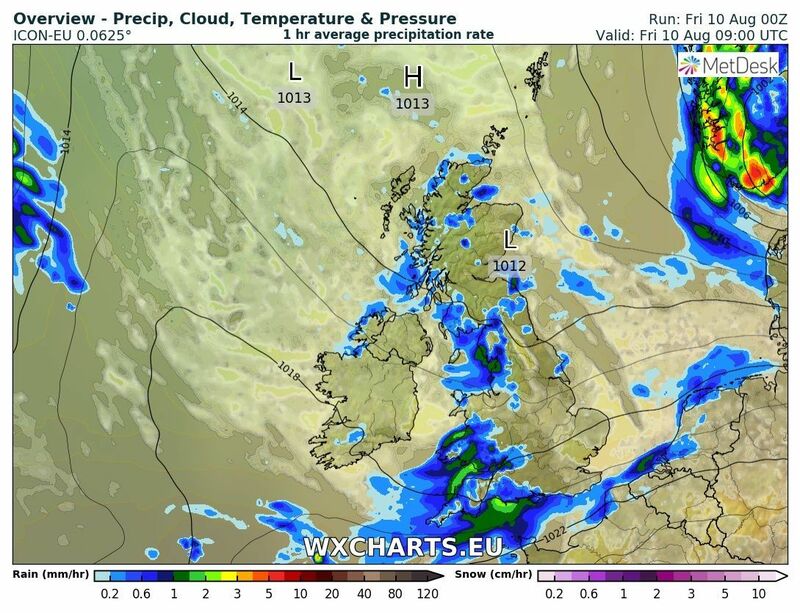 so generally a fine, fresher, start to the day which will continue in many places in the east but the key player today, and as it happens tomorrow, is the occlusion lying along western coasts. 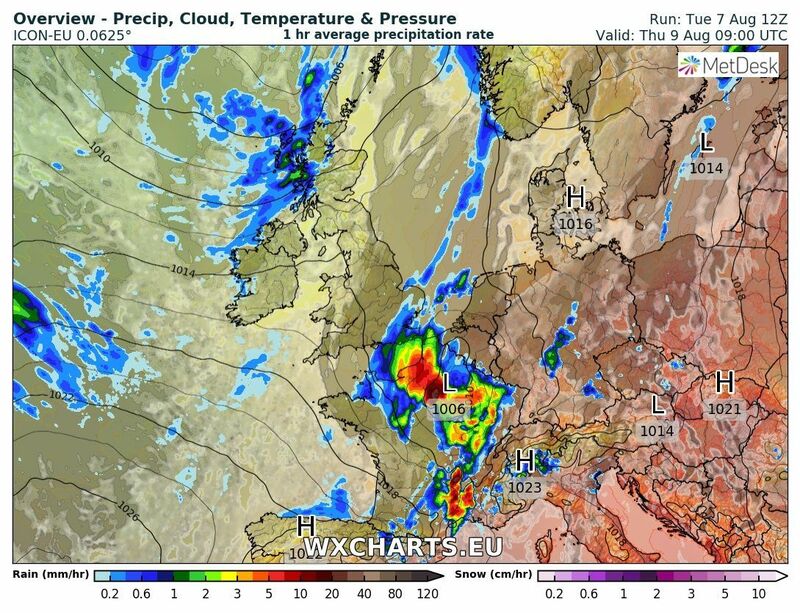 This well track slowly east and frequent heavy showers will be generated in it's wake mainly concentrated in northern and western areas. 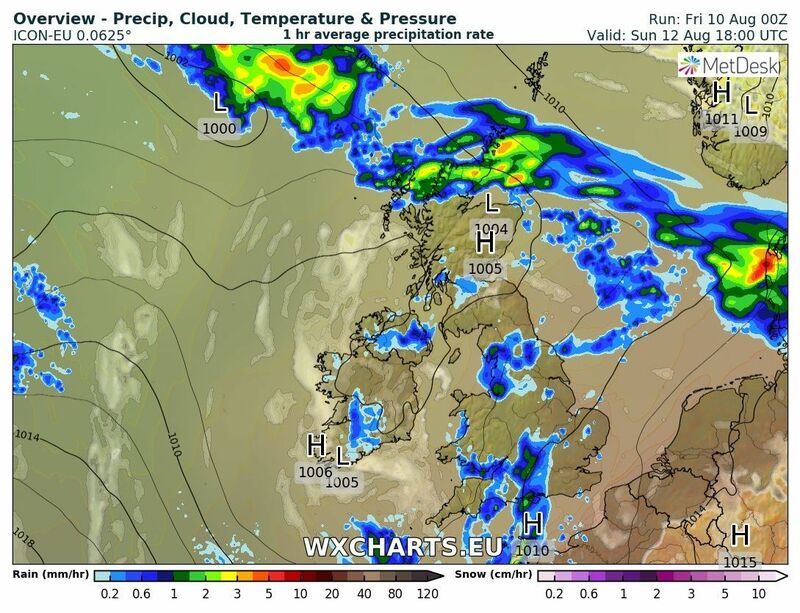 The sooth east will stay dry and pleasantly warm. 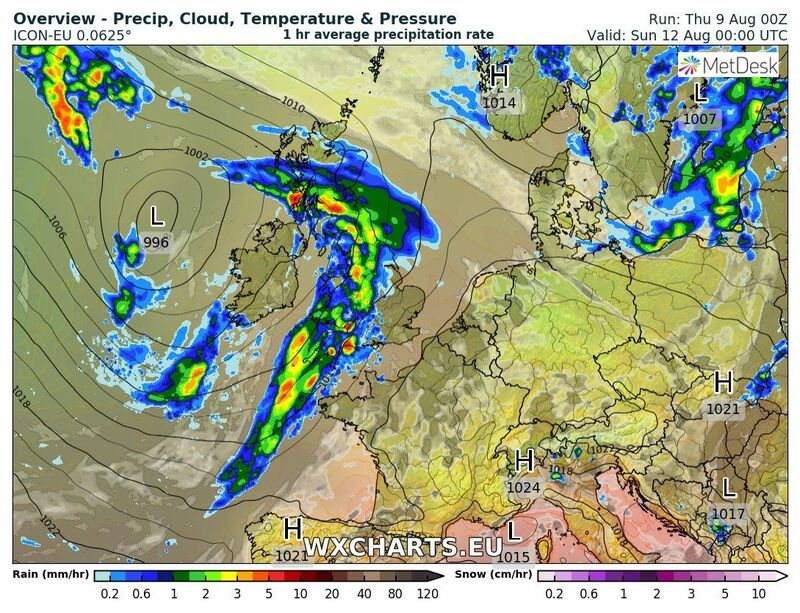 as a wave develops on the front and tracks north east. 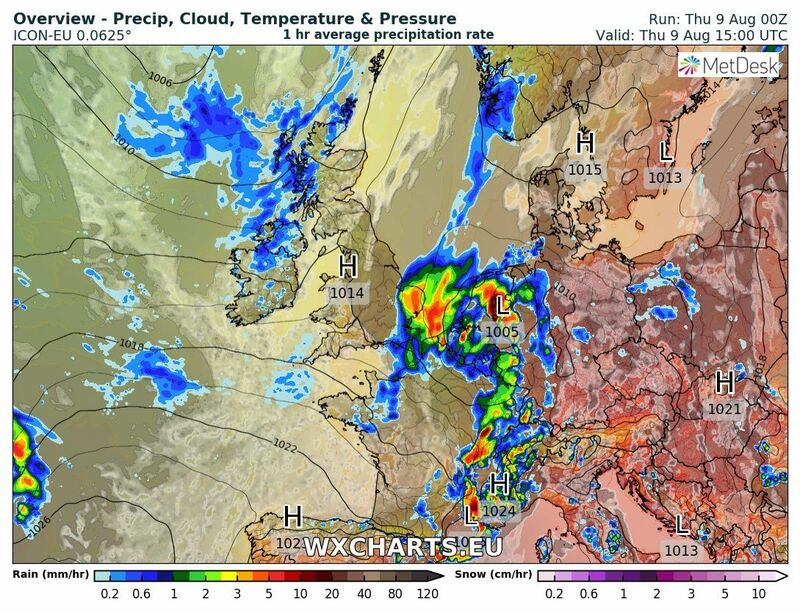 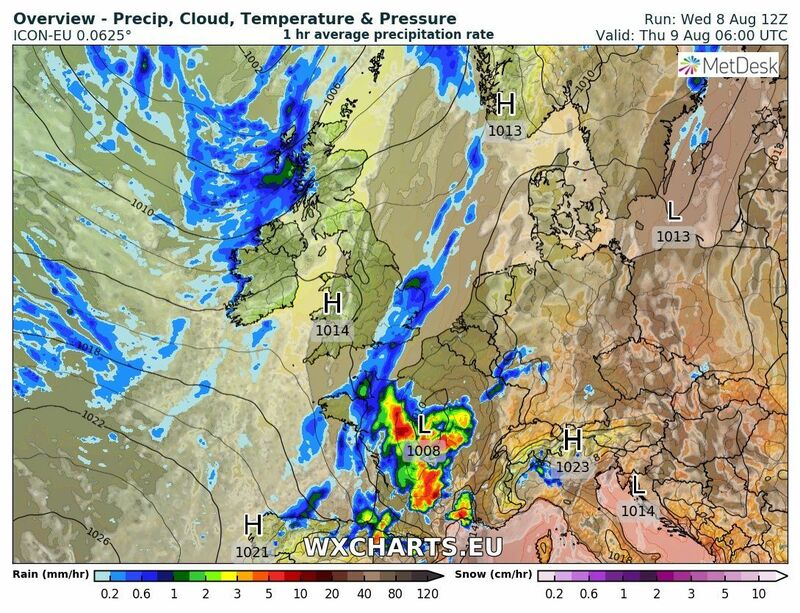 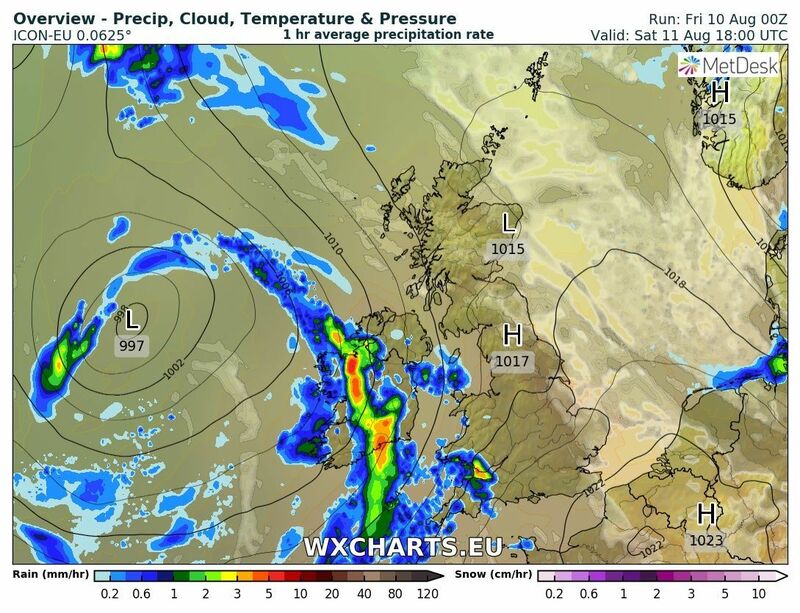 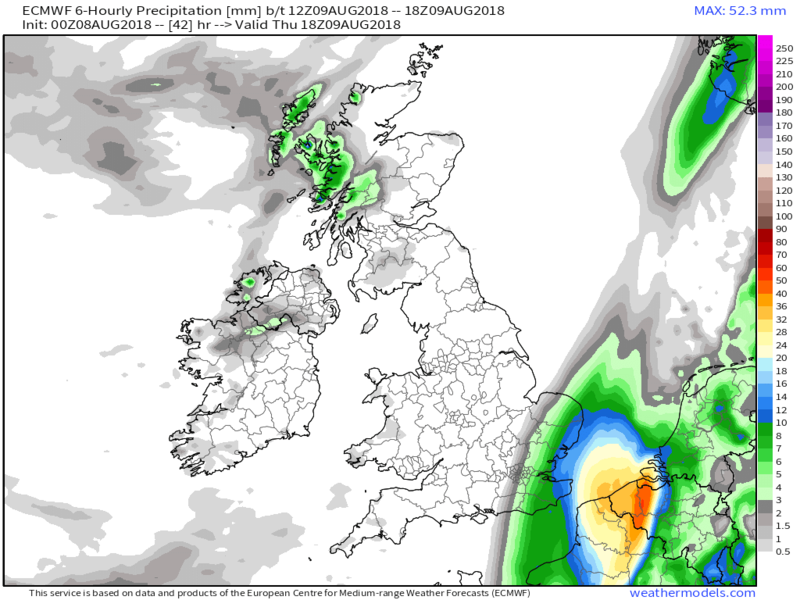 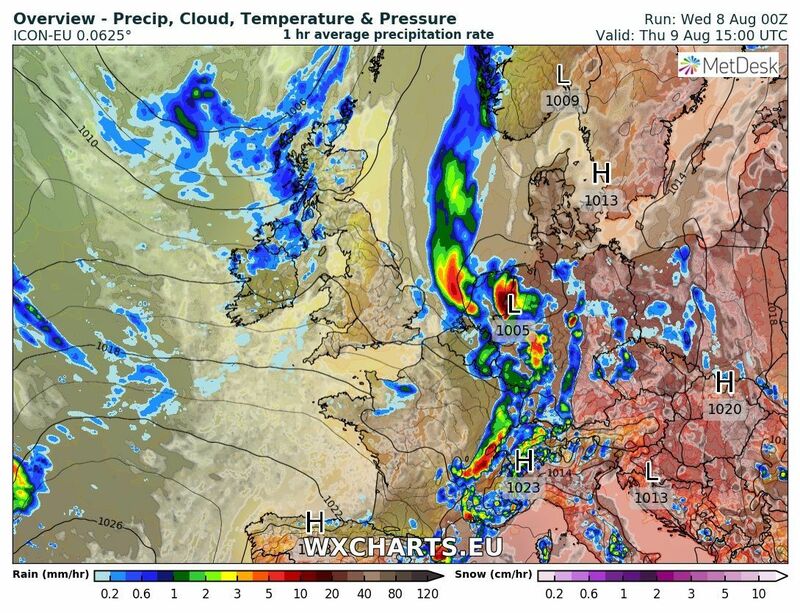 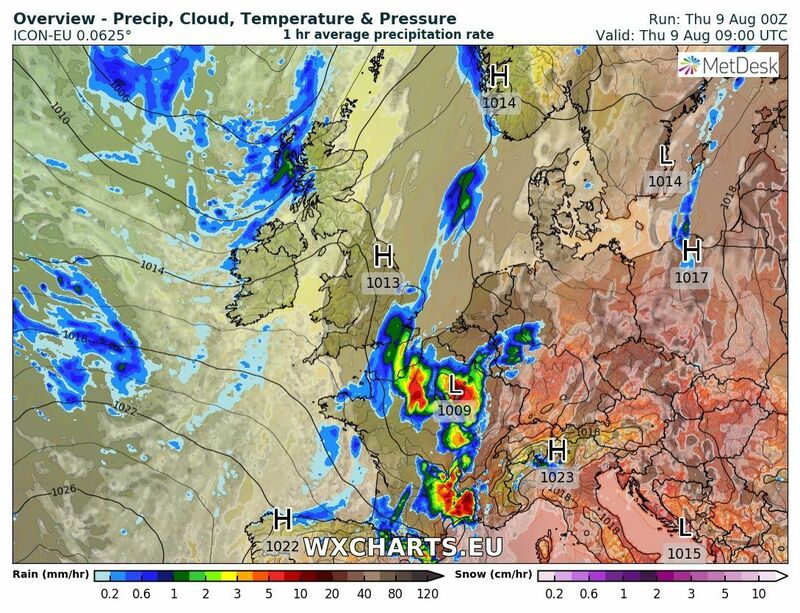 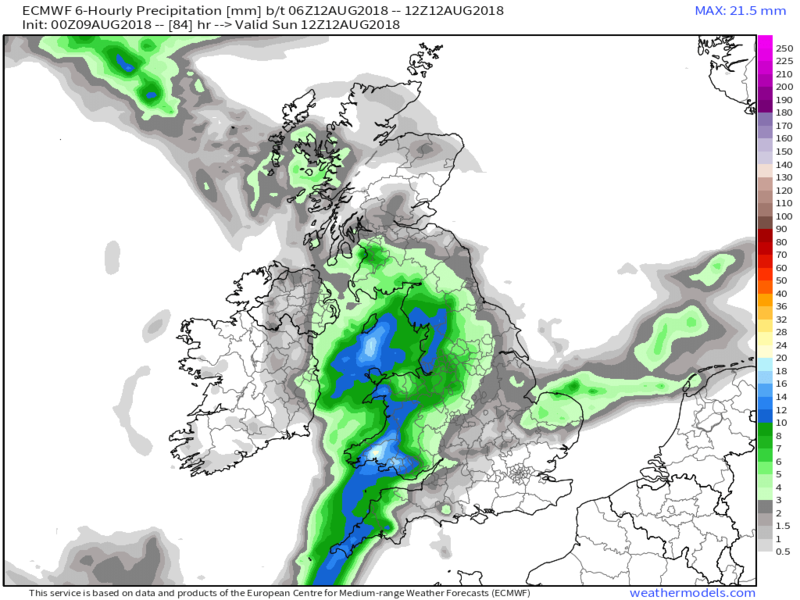 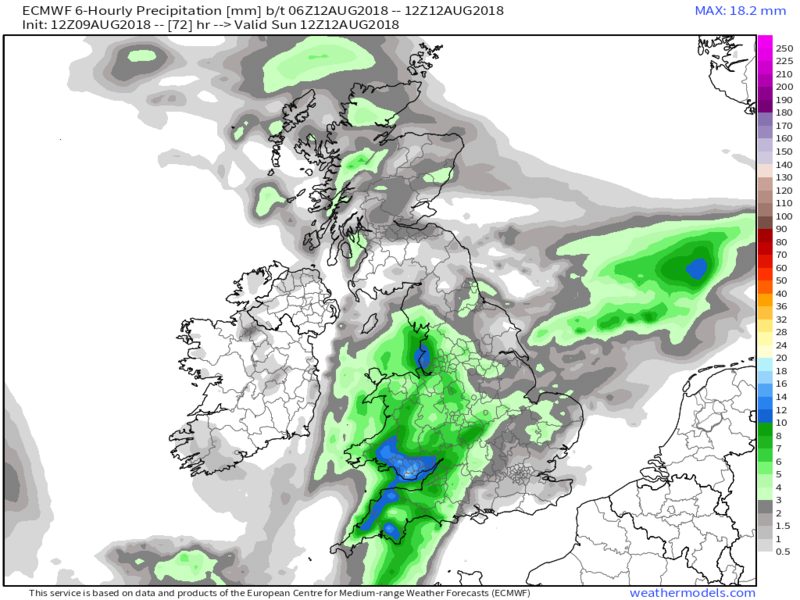 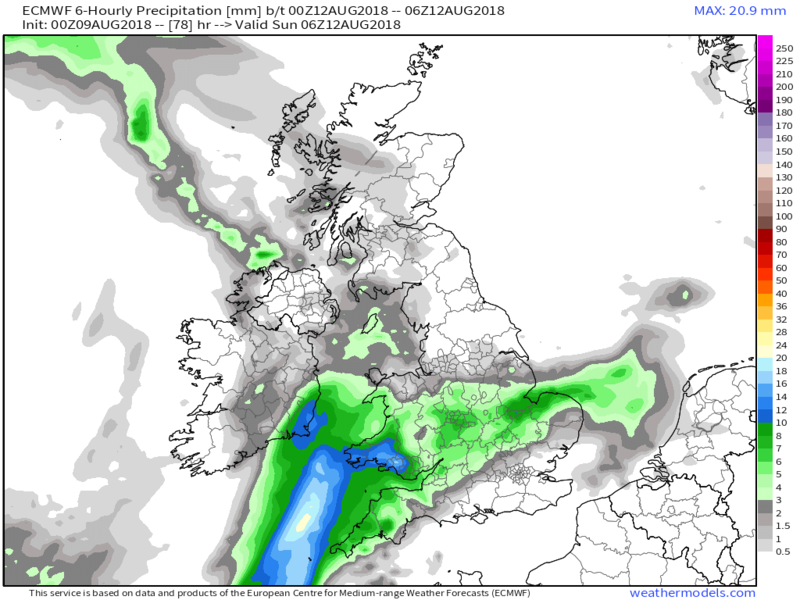 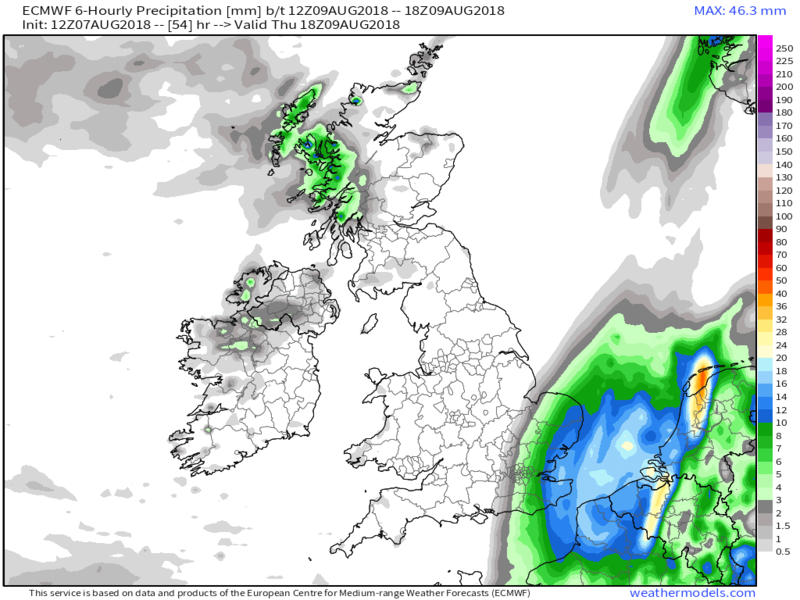 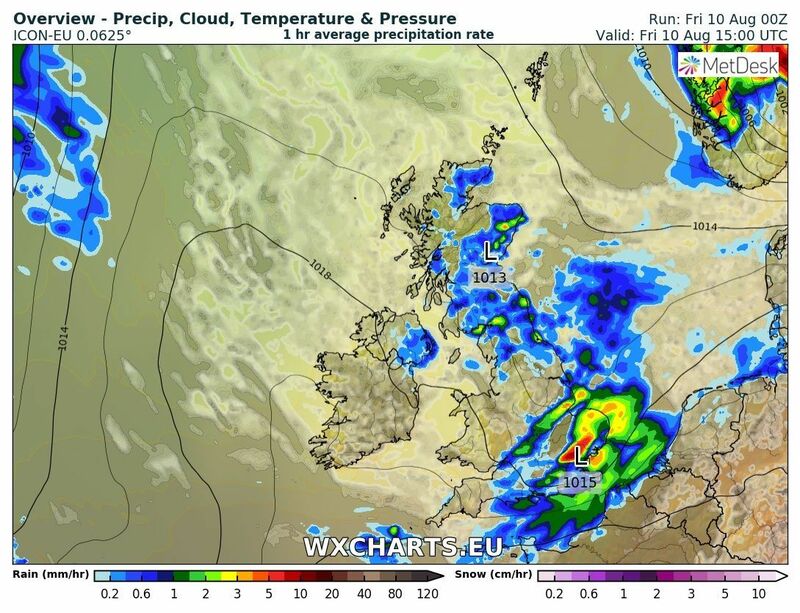 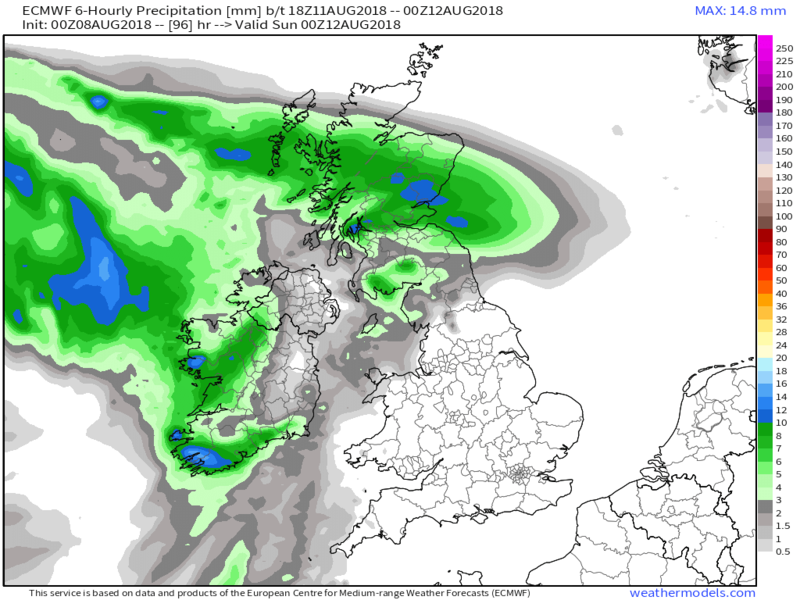 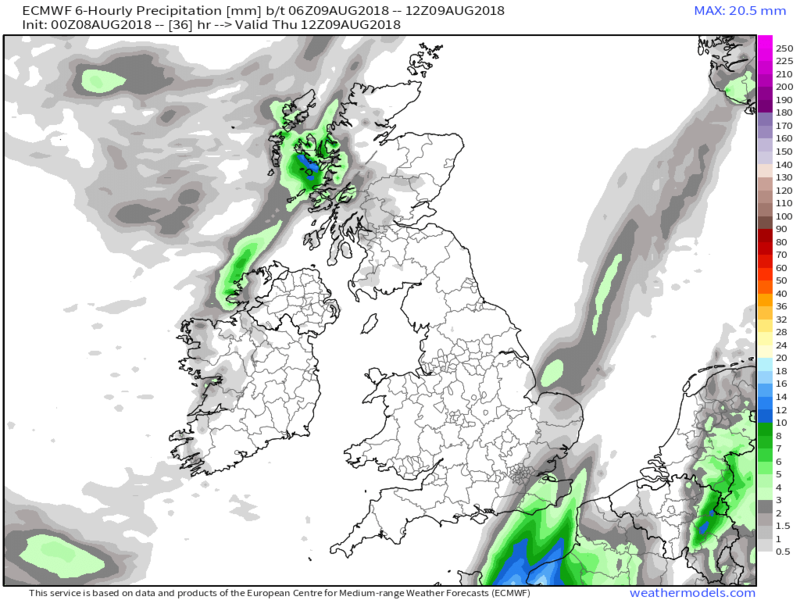 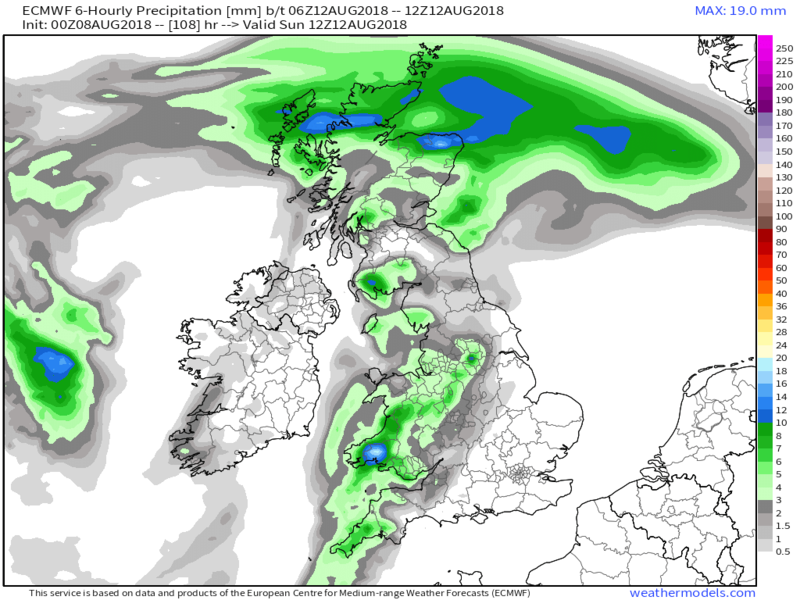 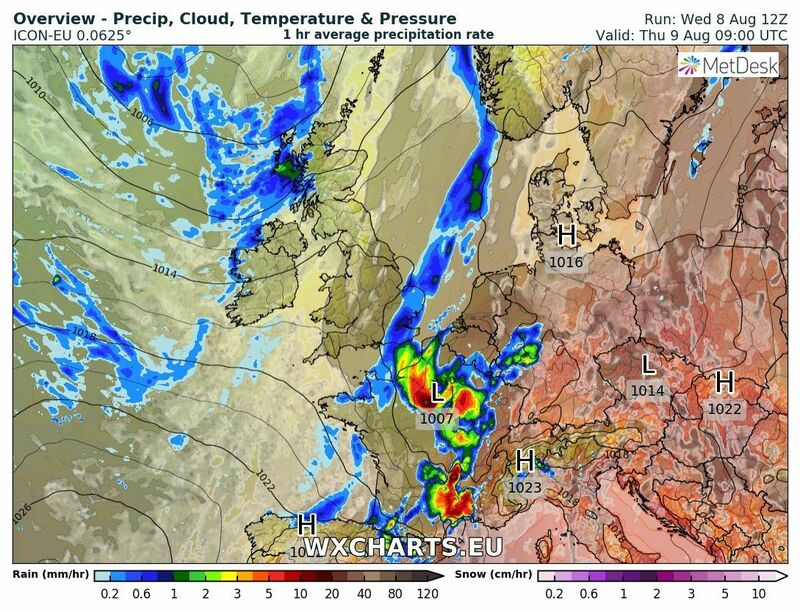 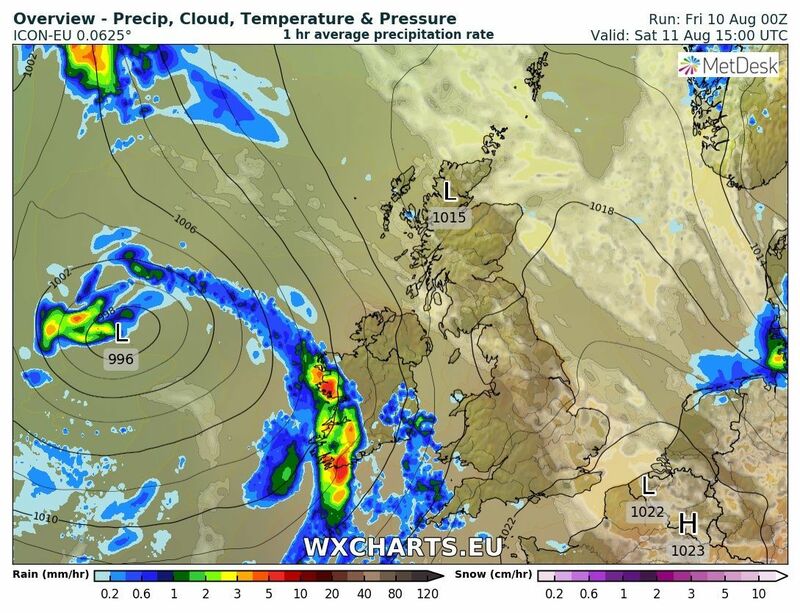 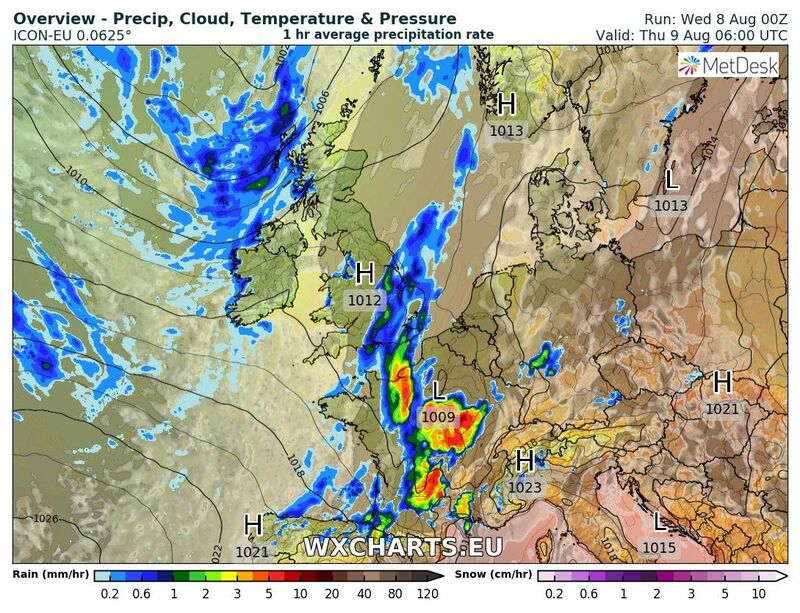 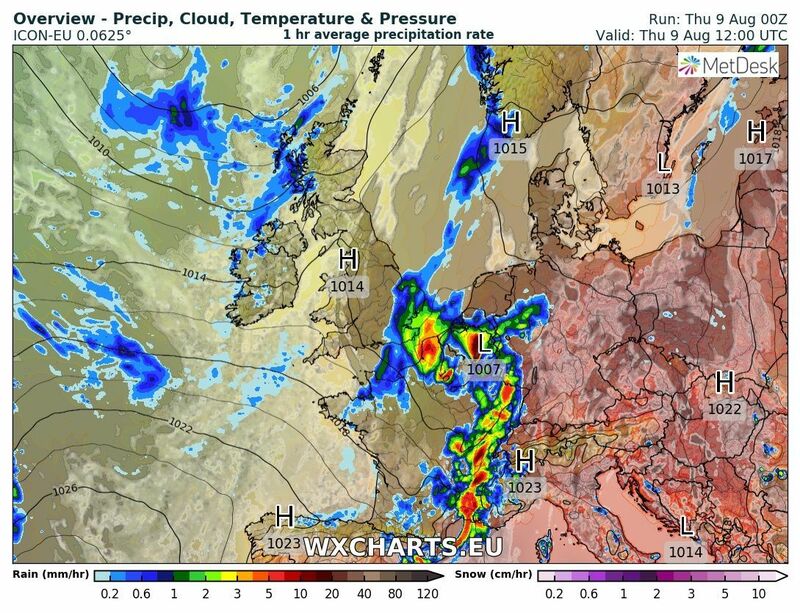 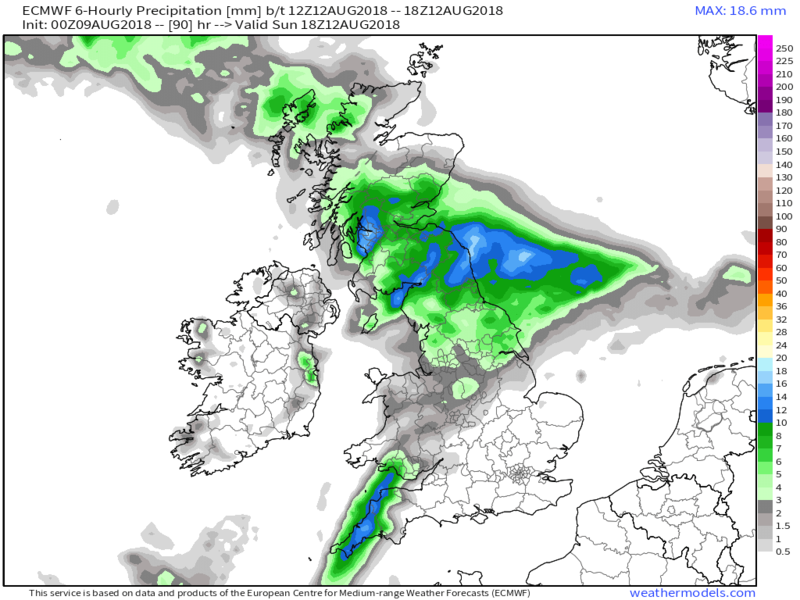 The system itself will pass to the east of the UK so how much the of the heavy thundery rain will effect the south east is still not certain but, according to the Icon, that area can expect some showery outbreaks. 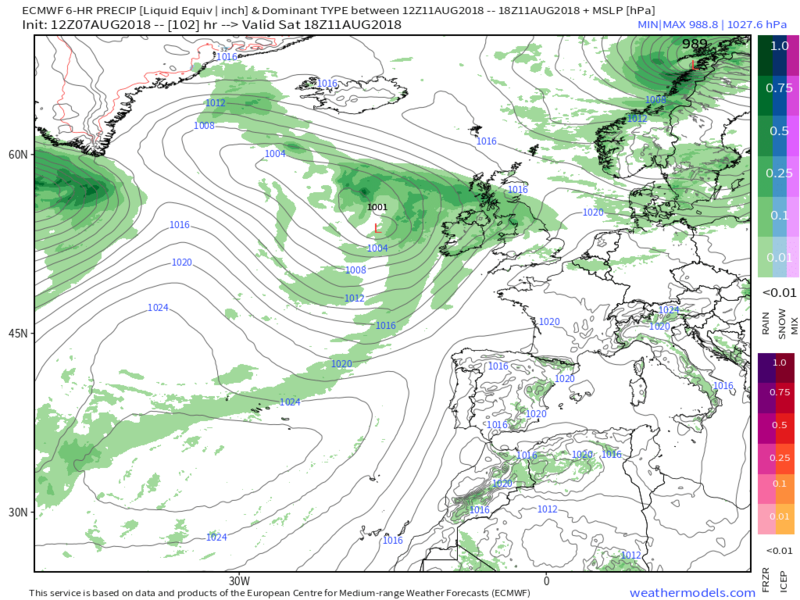 But by Saturday the depression out in the Atlantic has become more organized and is 995mb south of Iceland with the associated fronts bringing strengthening winds and rain, heavy in places, to the north of the UK. 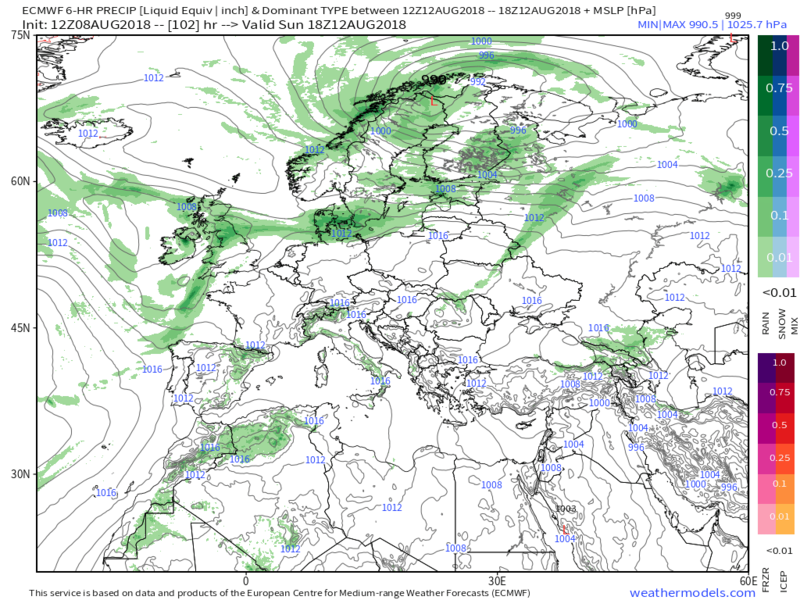 On Sunday the cloud and rain has slipped a bit further south but as the upper trough has also extended further south some warmer air has been advected into East Anglia. 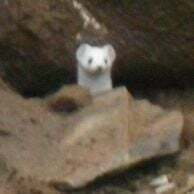 Thank you Knocker , for your superb, "ramp" free synopsis, during the past few months.  What a fantastic job you do on here. 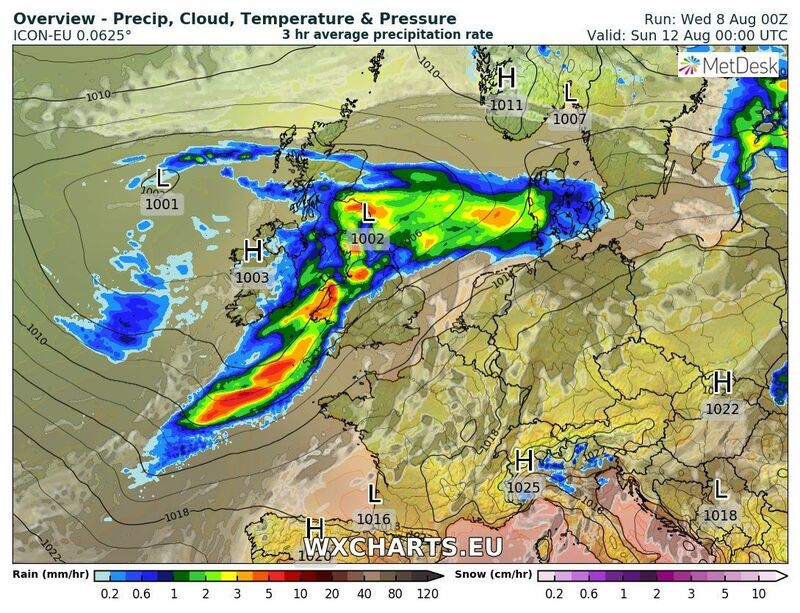 If the above happens it sure will prove the variability of our weather for once and all. 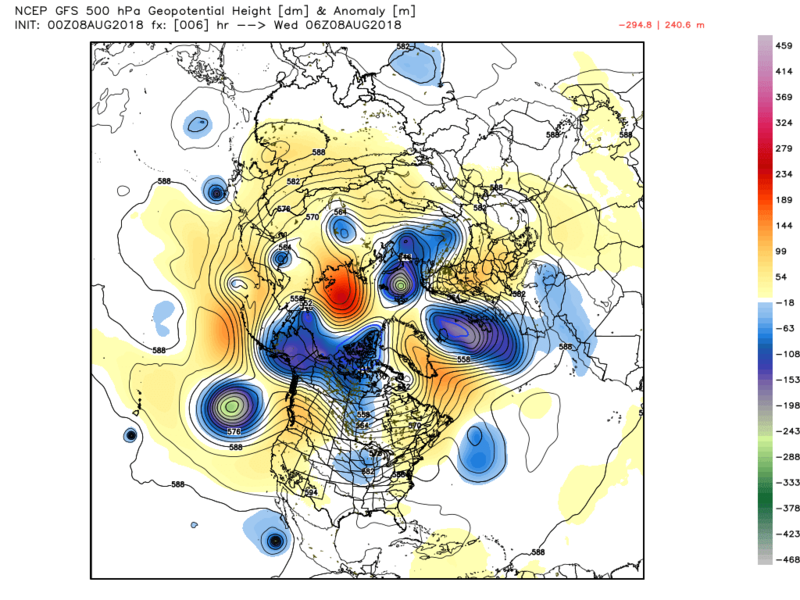 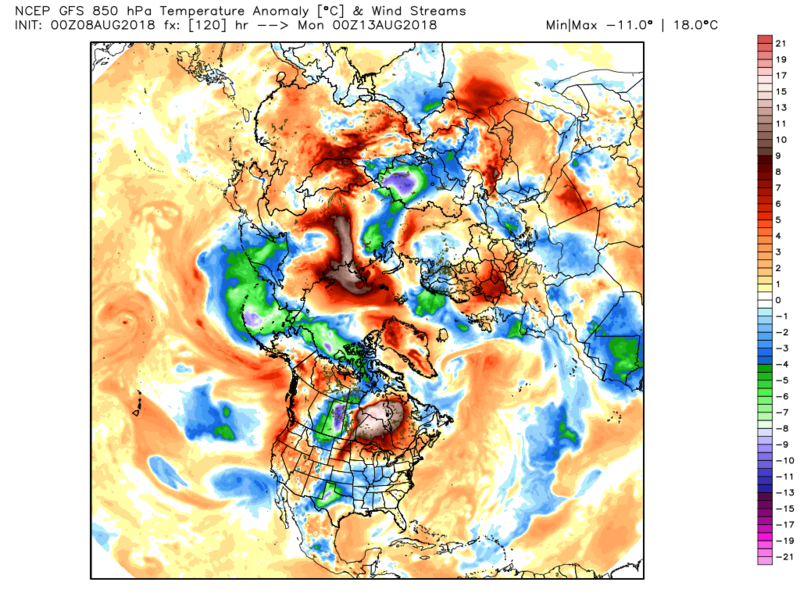 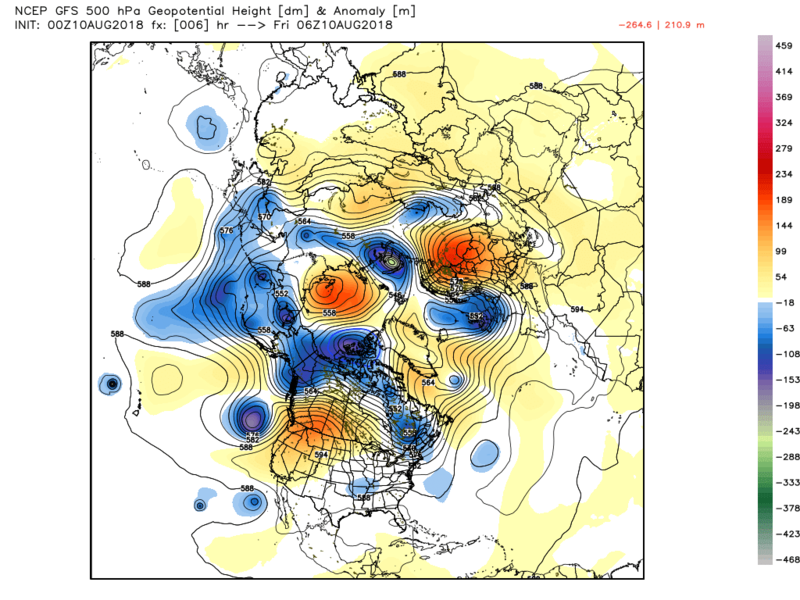 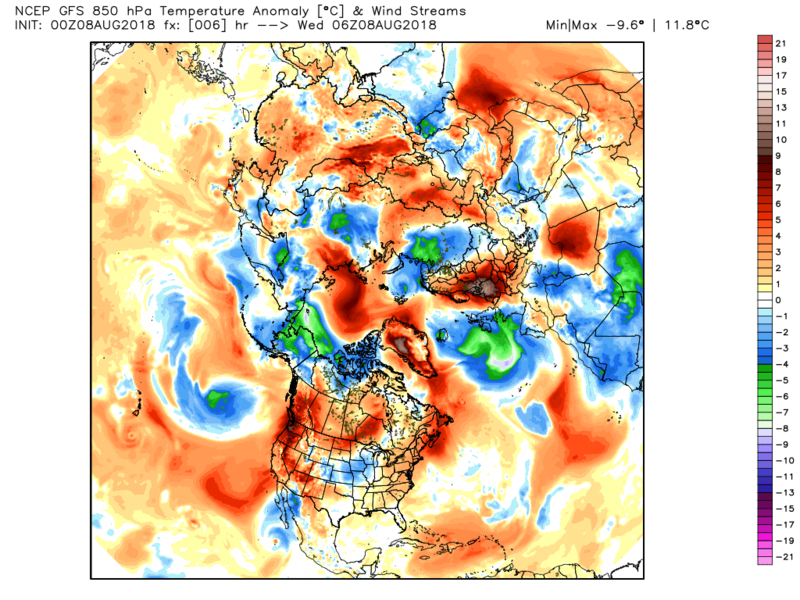 If it comes off then Spain and particular N Africa are now amongst the cooler areas. 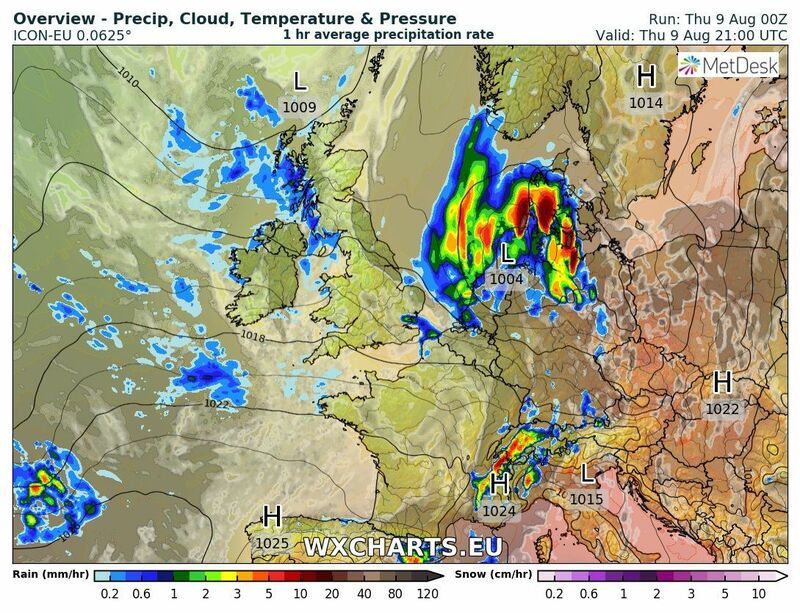 The same applies to Scandinavia. 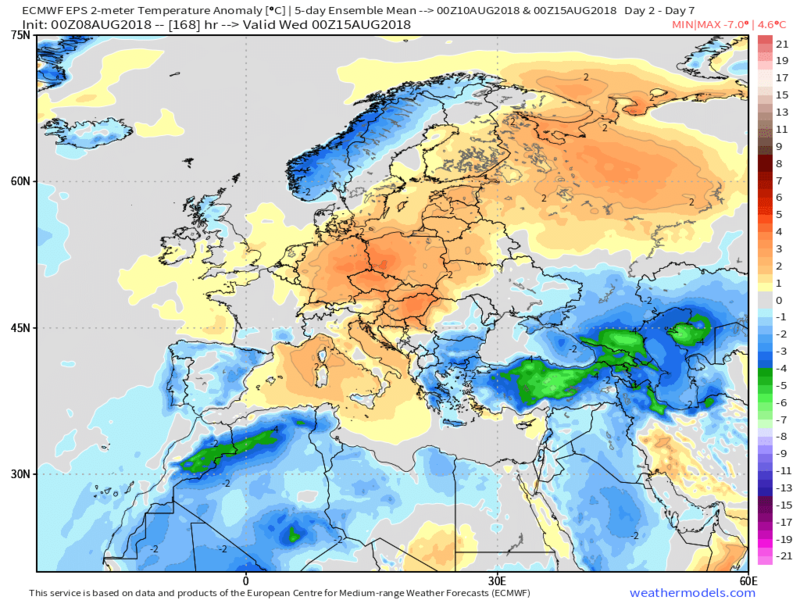 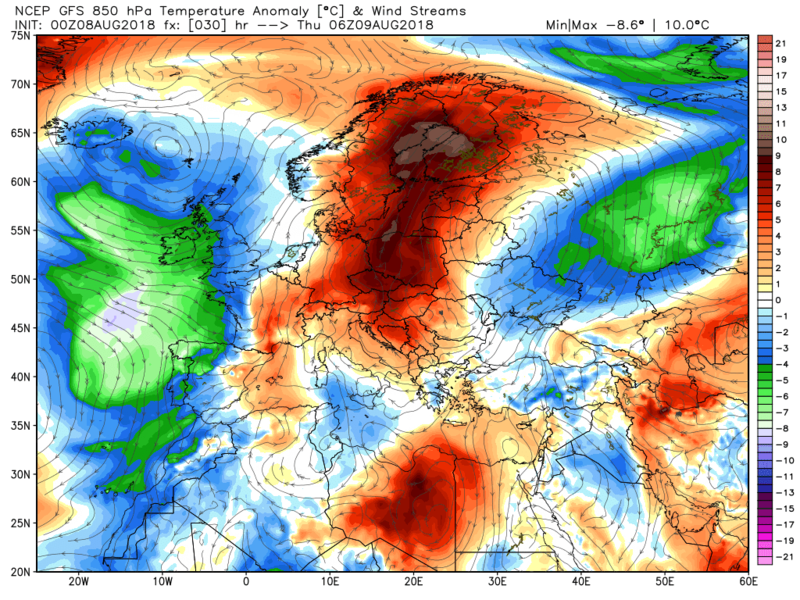 The heat does continue in Central Europe, but to the SE and particularly in the Middle East it is looking distinctly chilly for the time of year. 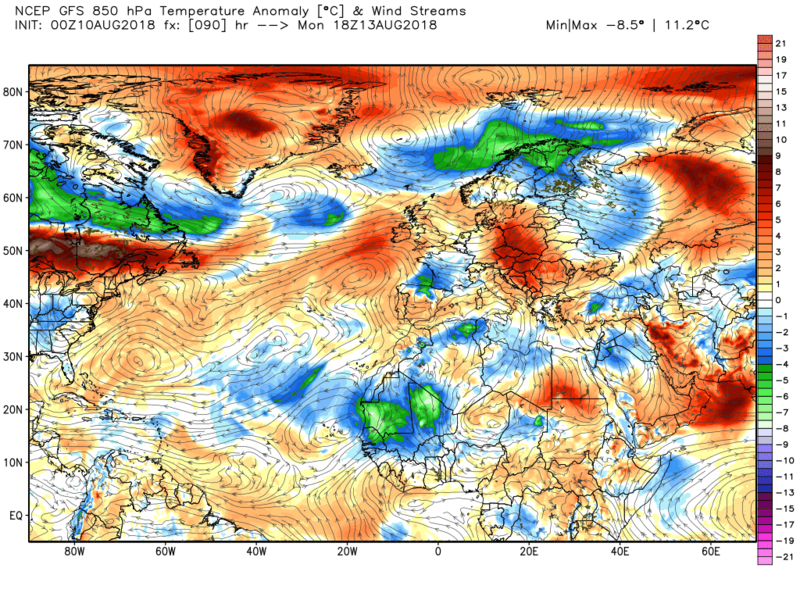 No wonder we can become enthralled in our changing climate. 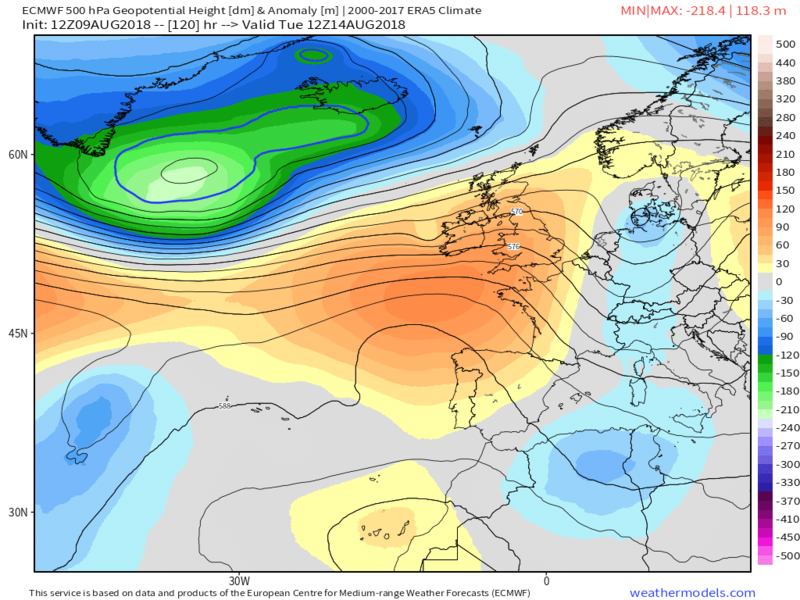 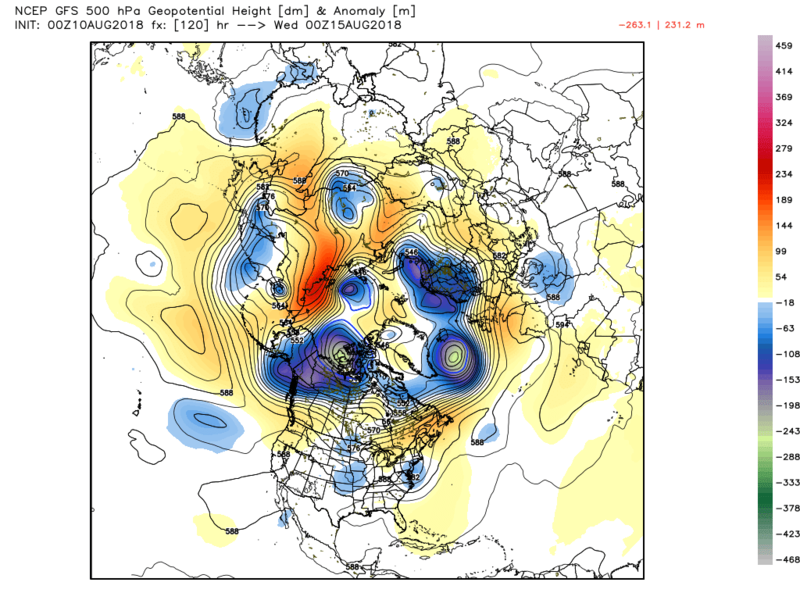 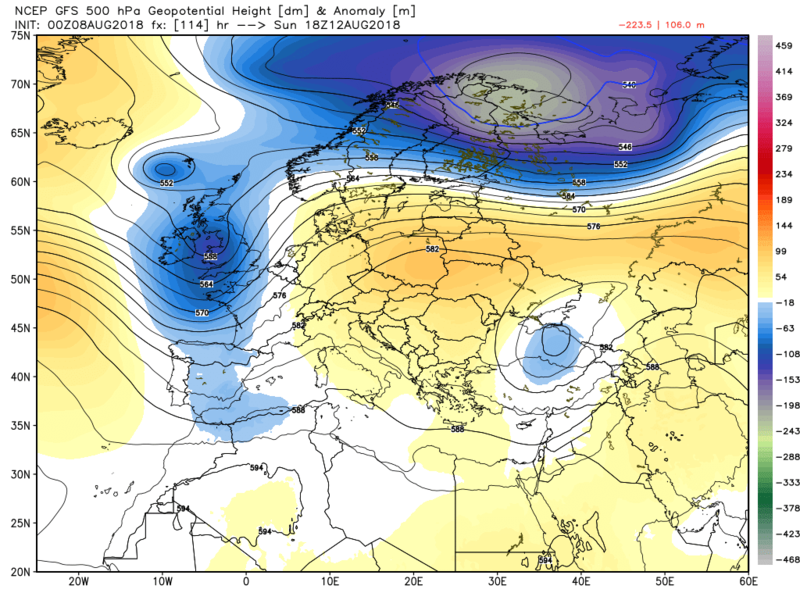 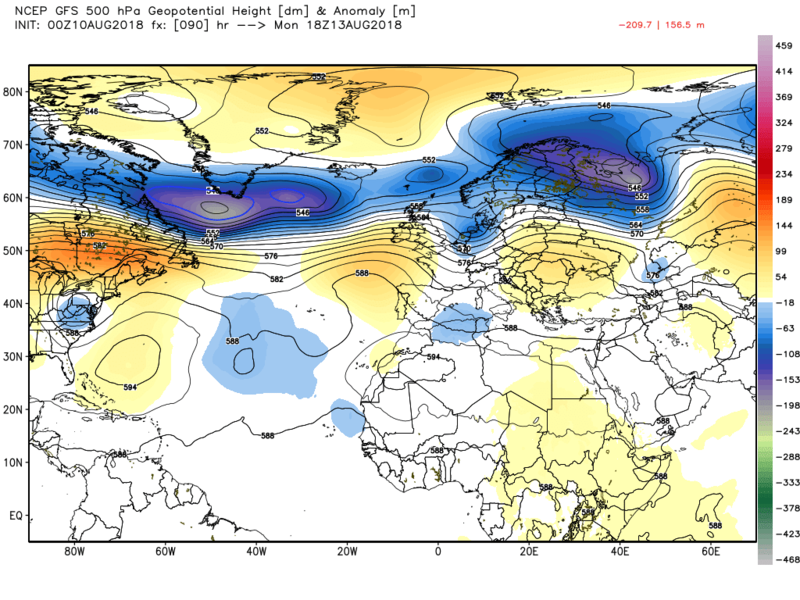 The ecm has the upper trough/low west of Ireland at T72 and swings it east over the Uk by T120. 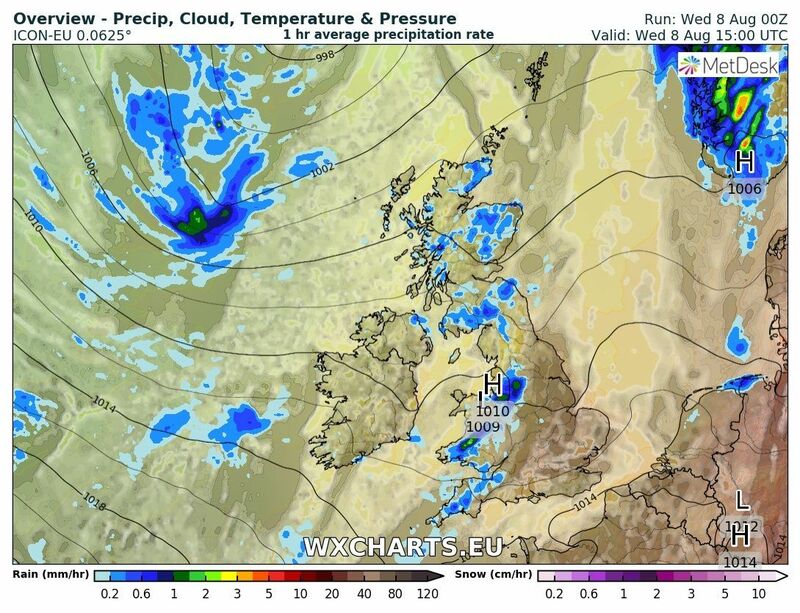 Which on the surface translate to a pretty wet and breezy weekend for most of the UK from Saturday morning onwards. 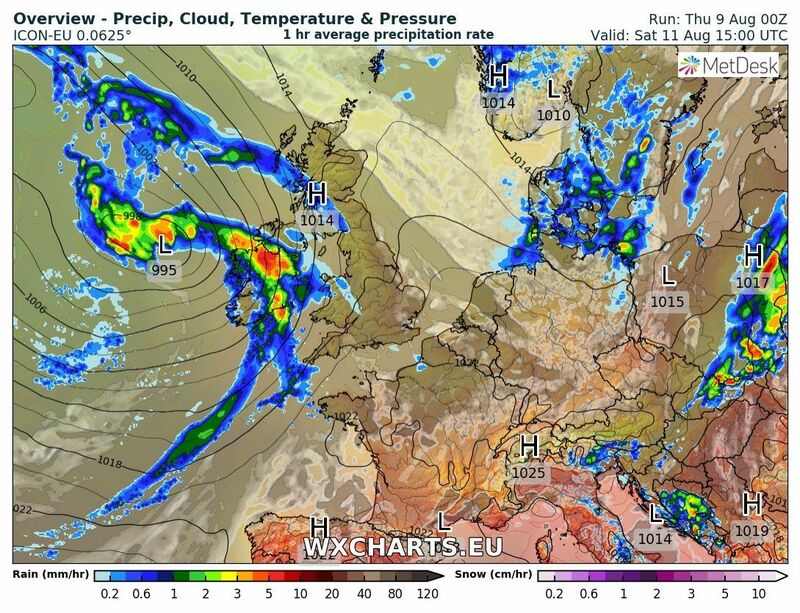 No change to the outlook from yesterday so this post is essentially an update on last evening's posts. 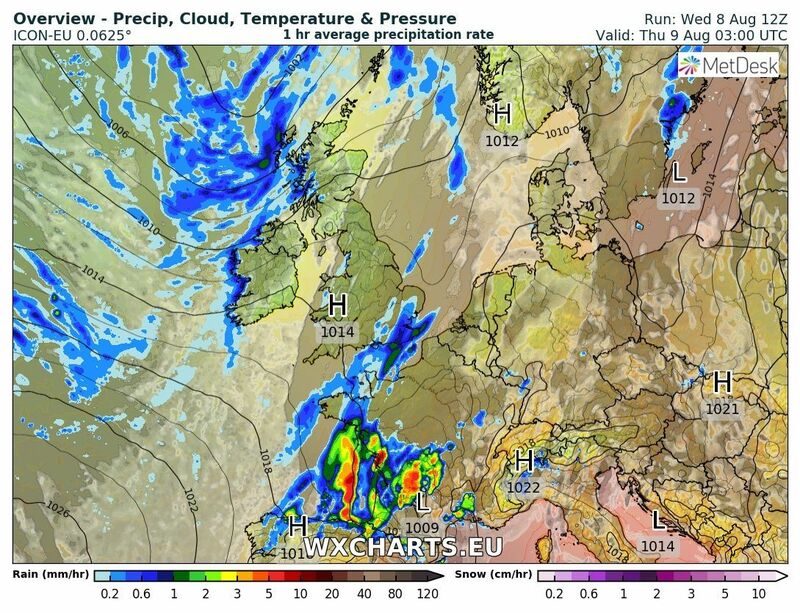 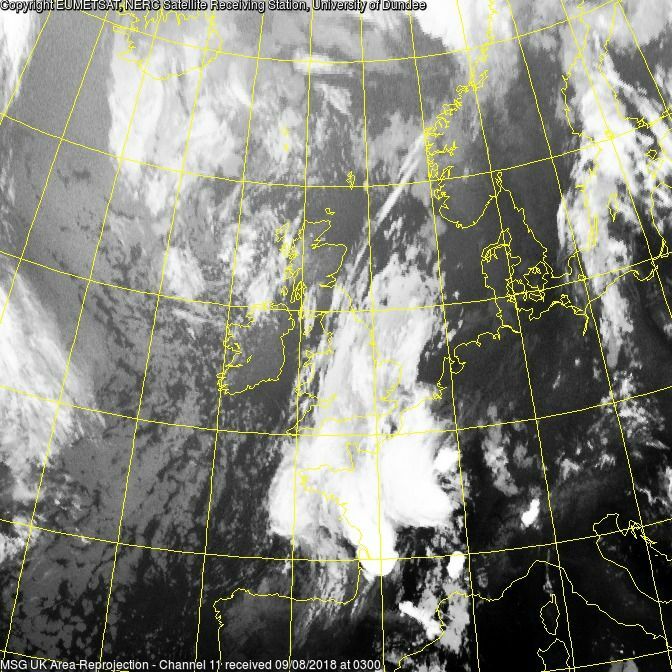 This rain will persist all day in the south east as the developing wave over Biscay tracks north east into the North Sea. 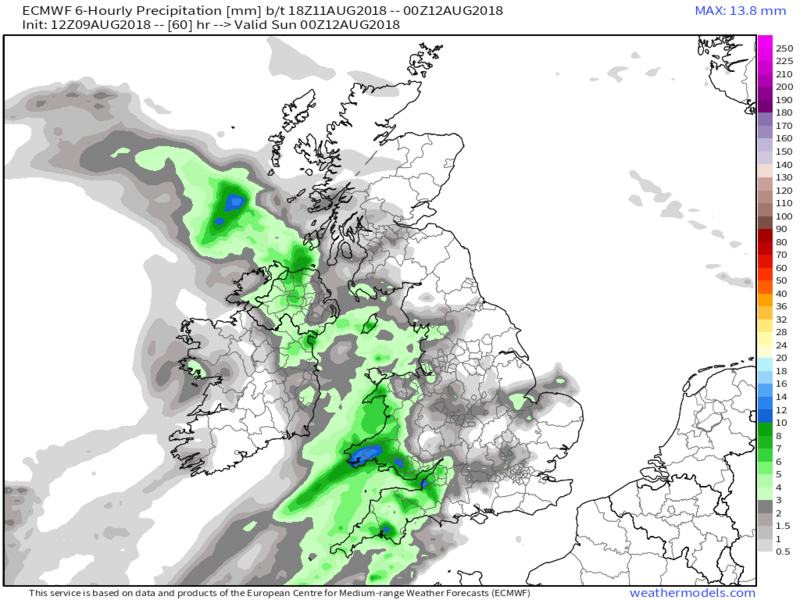 Heavy outbreaks are possible at times and quite how far west the rain gets is still dependent on the precise track of the low. 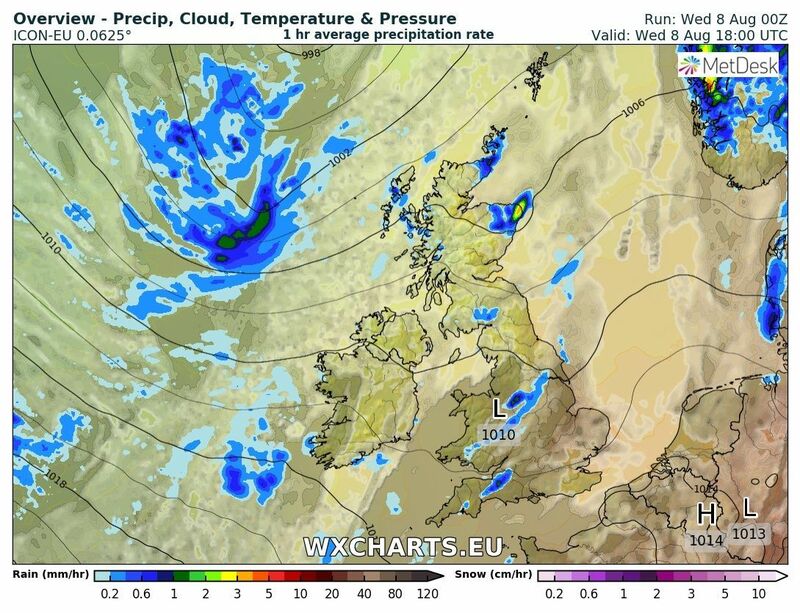 One thing is for sure with the rain and a fresh onshore wind it will feel much cooler than of late. 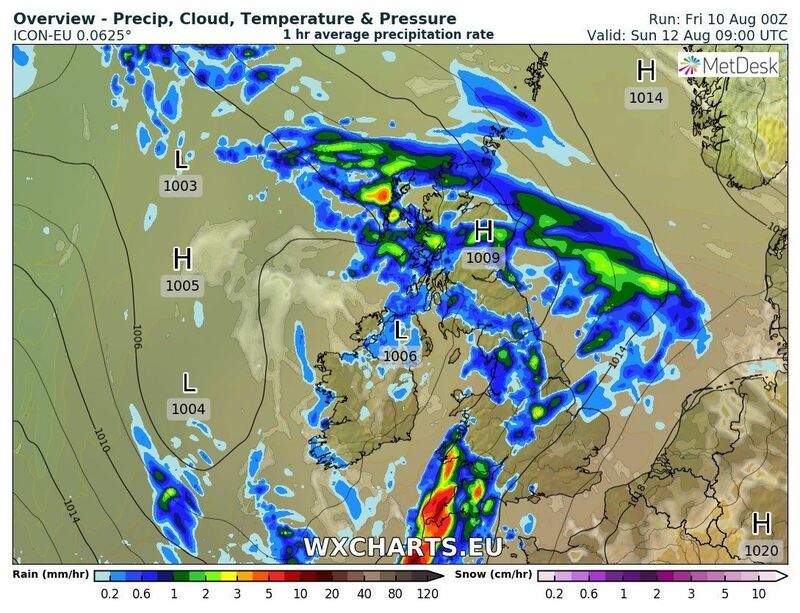 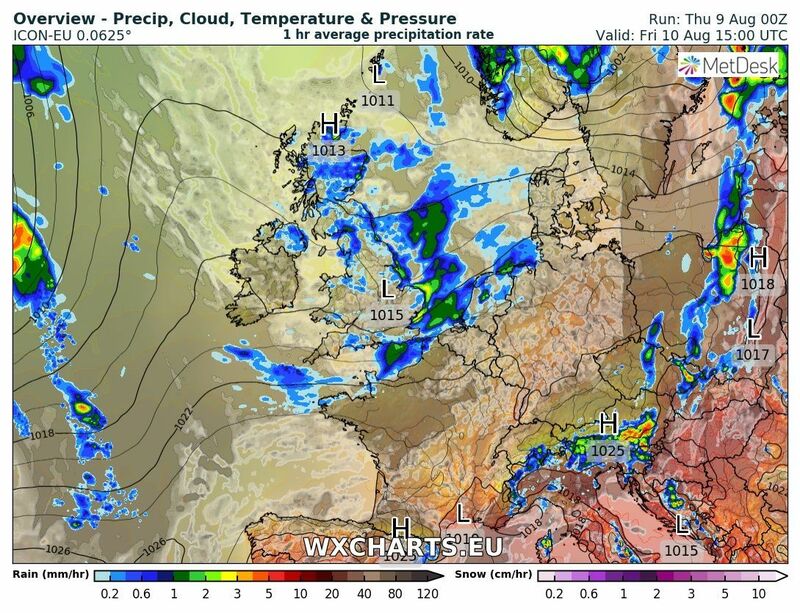 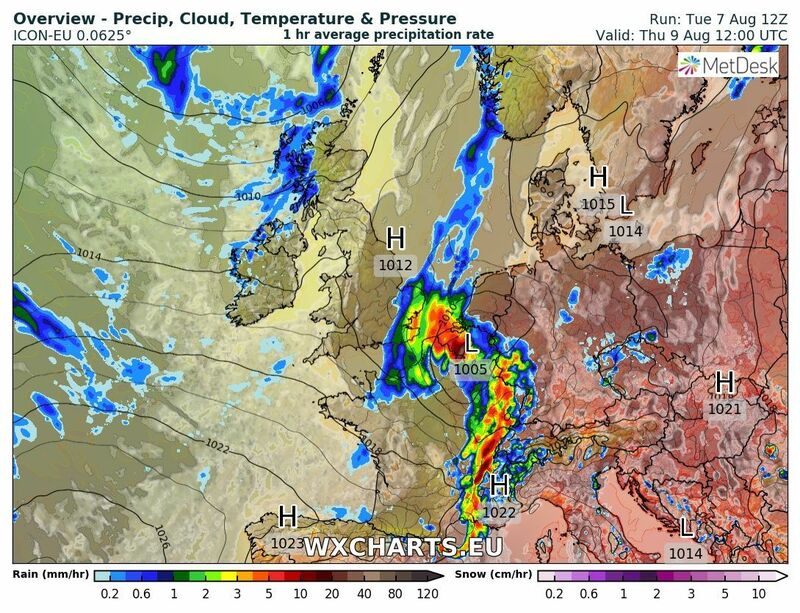 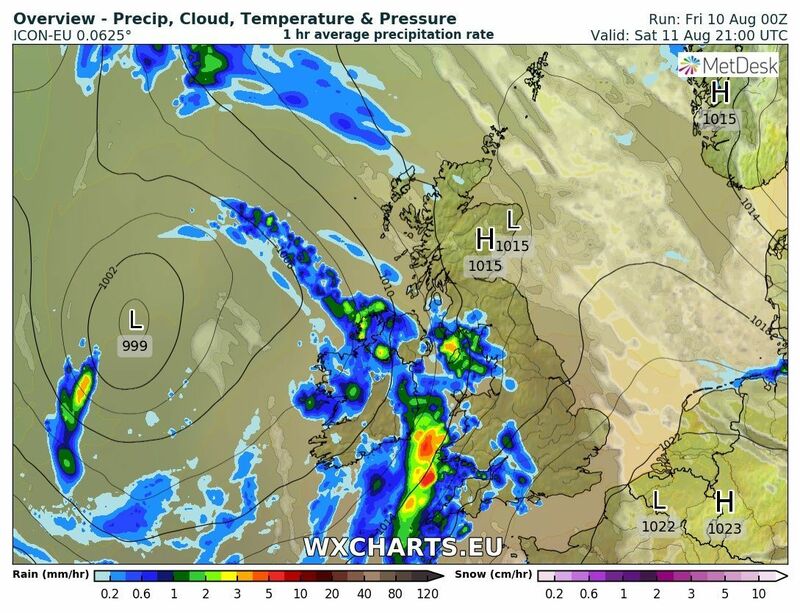 Elsewhere heavy showers will get going, particularly in the north west but all western areas will be effected. 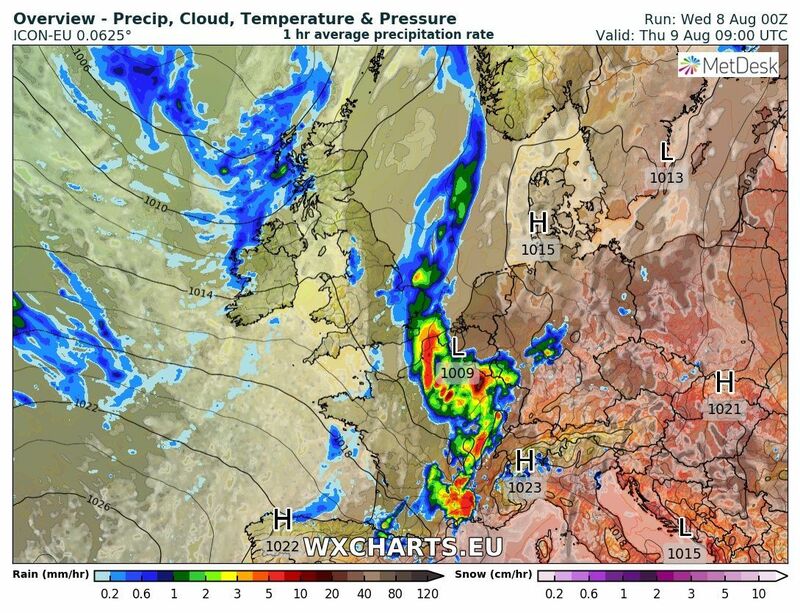 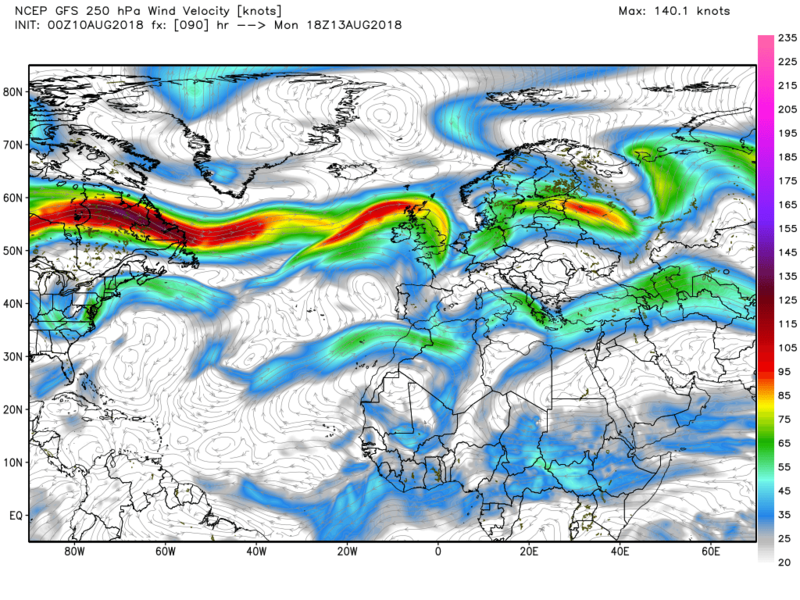 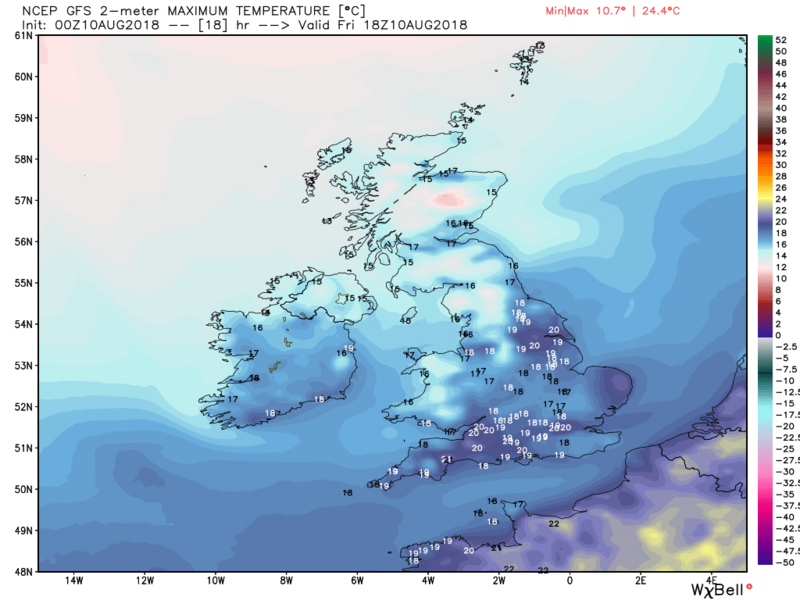 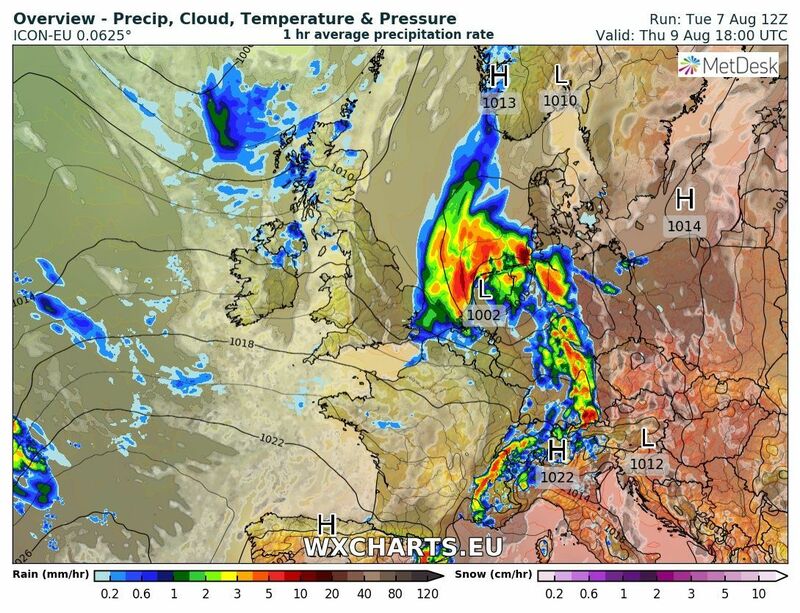 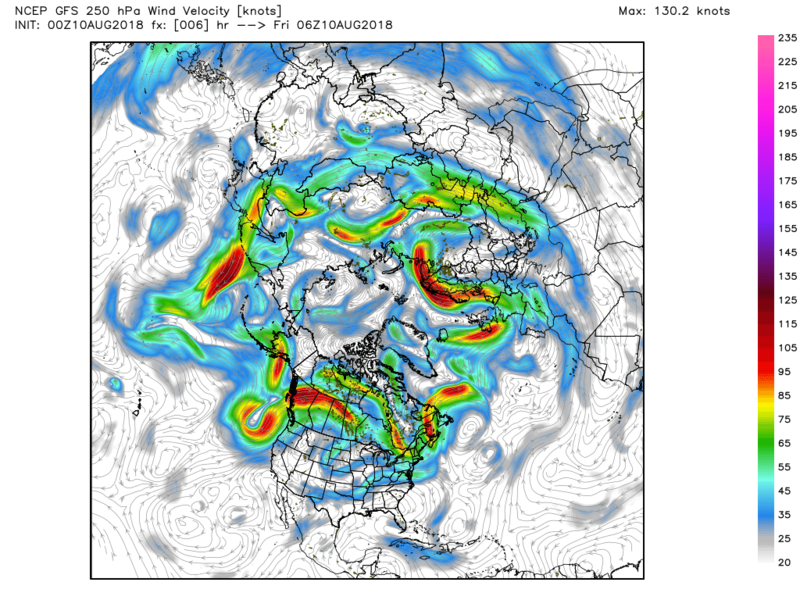 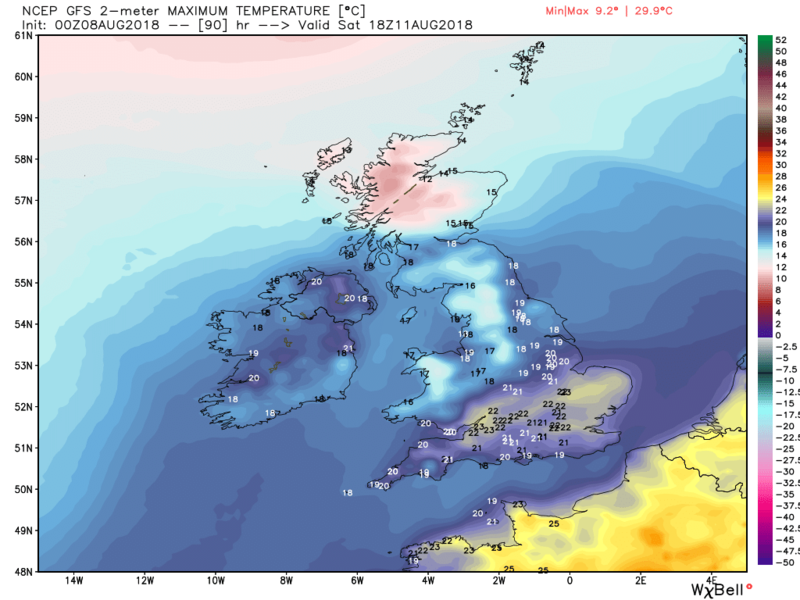 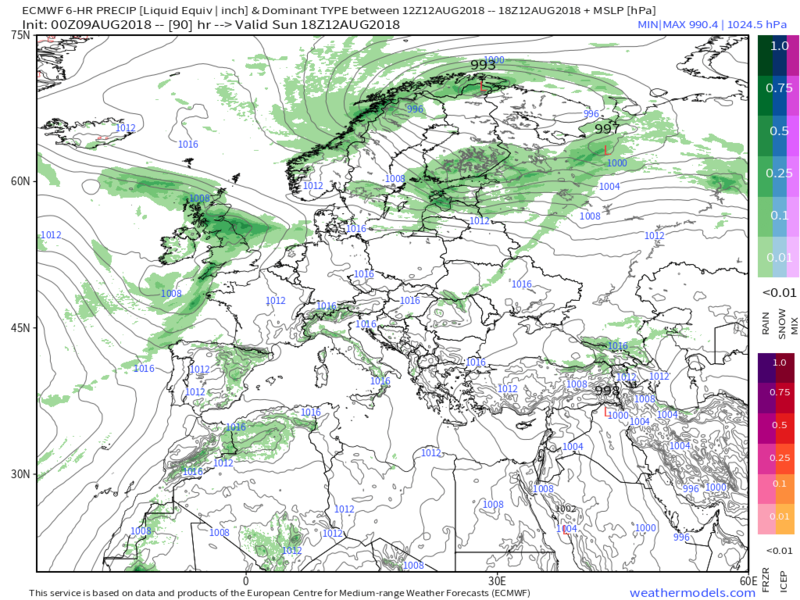 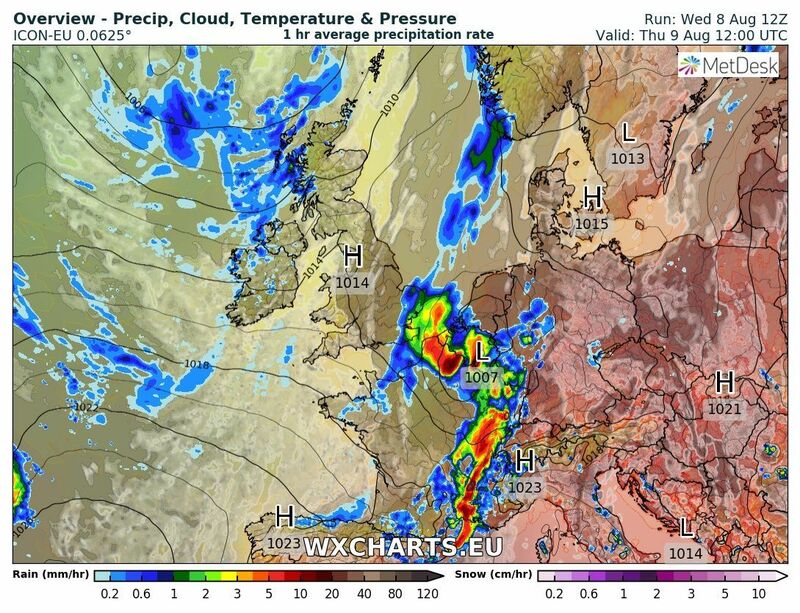 The low continues its journey north east overnight and through Friday initiating some quite inclement weather into southern Scandinavia and leaving the UK in a fresh WNW airflow. 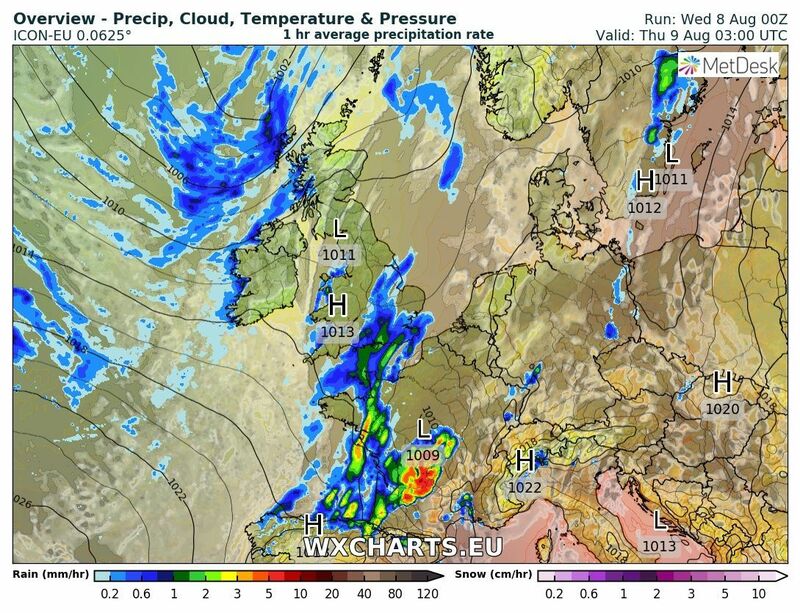 Thus showers will be the order of the day becoming frequent and heavy in places and quite lengthy if they merge. 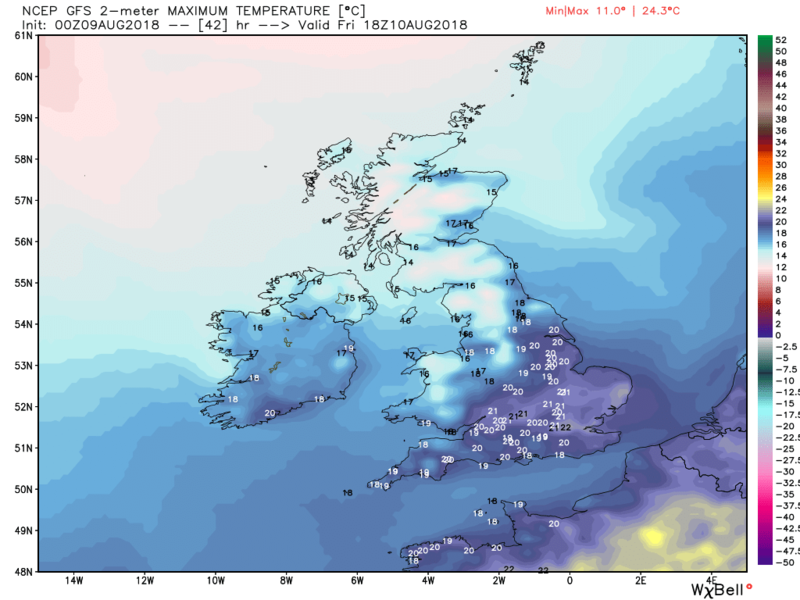 Quite a cool day with temps shading below average. 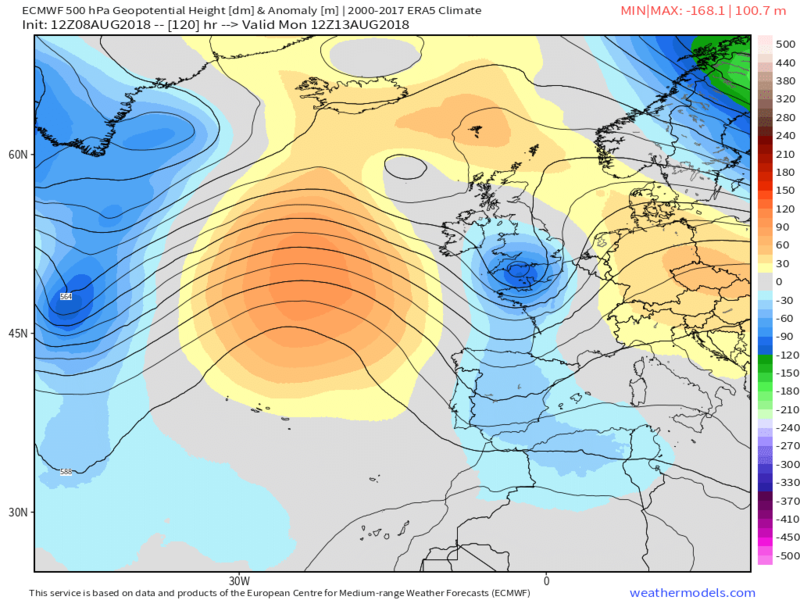 Overnight Friday a very transient ridge builds but out west in the Atlantic a large area of low pressure is getting organized and by lunchtime a myriad of fronts associated with this are lining up over Ireland so that after a bright start to the day cloud and rain with strengthening winds will sweep in ans effect most areas by midnight Sunday. 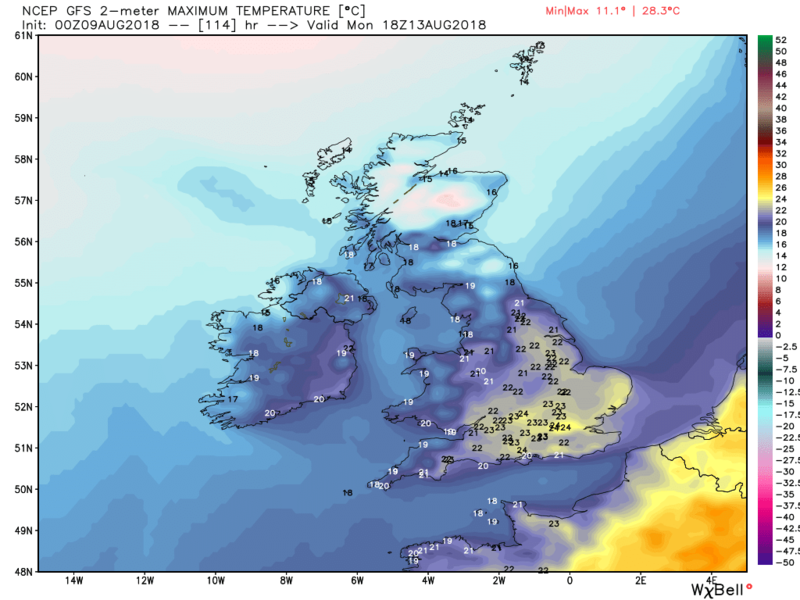 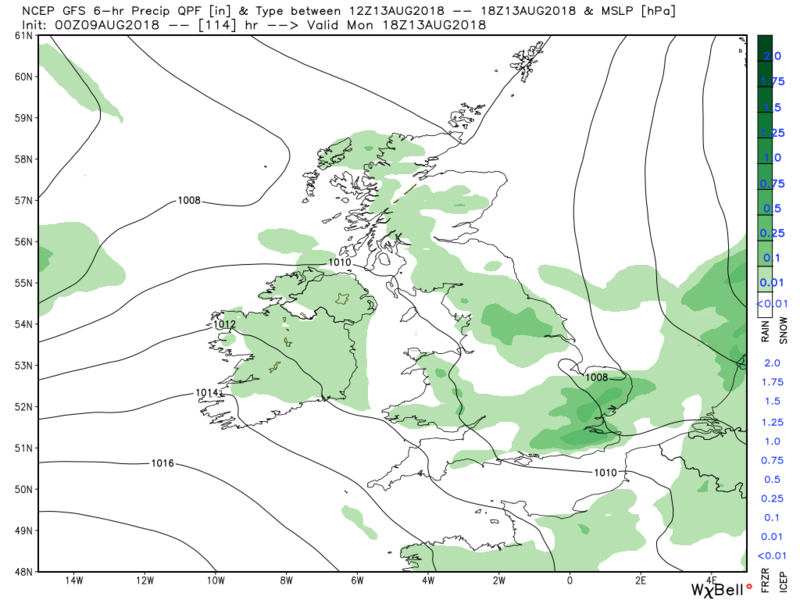 Sunday finds the low west of Ireland with various fronts traversing the country on a fresh south westerly wind thus intermittent rain in most places (I'll skip the rainfall charts) with sunny intervals Even a little warm spot over East Anglia. 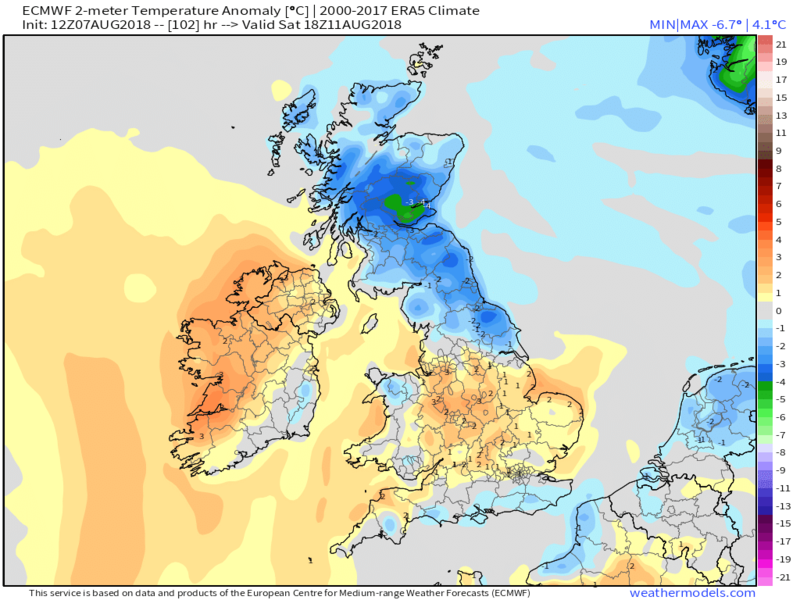 A quick resume of the weekend. 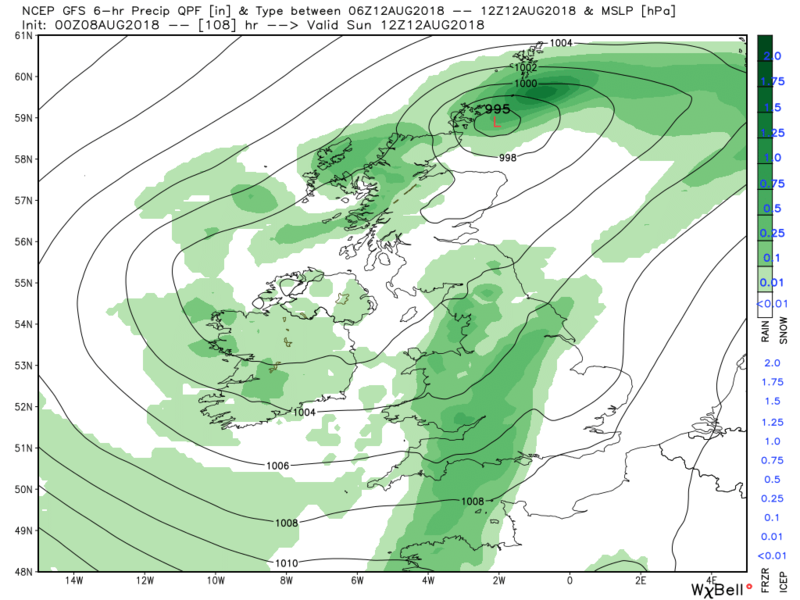 At 12 Saturday the low is 995mb is west of Ireland with the occlusion, the front runner of a number of front, already impacting the south west So in many areas Saturday will be fine and dry but during the afternoon and evening it will become increasingly windy with cloud and patchy rain spreading north east. 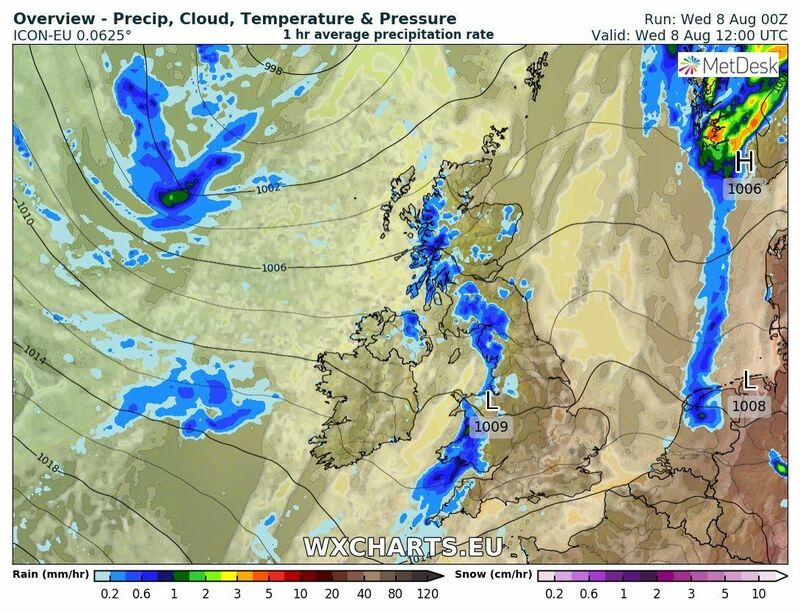 Cloud and patchy rain pretty much the order of the day on Sunday as well but clearing in the areas the cold front clears. 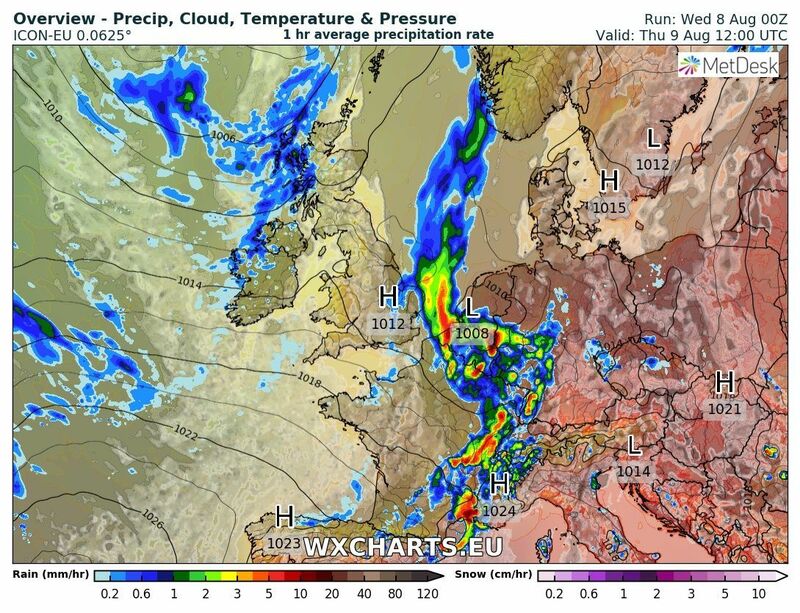 The current NH profile has a trough over the the UK, centred to the north of Scotland with a high cell over eastern Europe with a fair bit of energy traversing a fluid Atlantic. 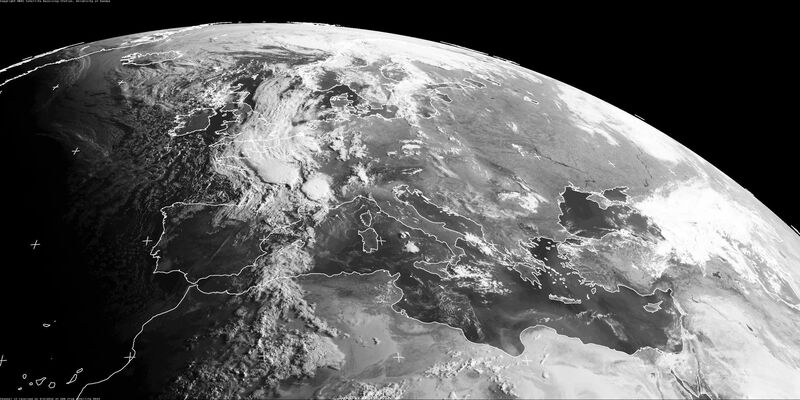 In more detail. 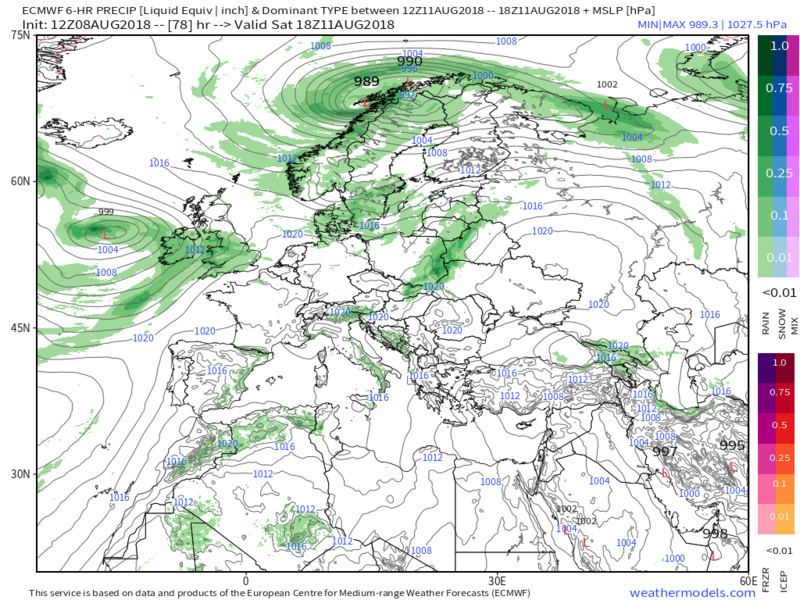 The low that brought rain and much cooler temps to the south east yesterday is now plying it's trade in Scandinavia leaving the UK in a brisk unstable westerly wind. 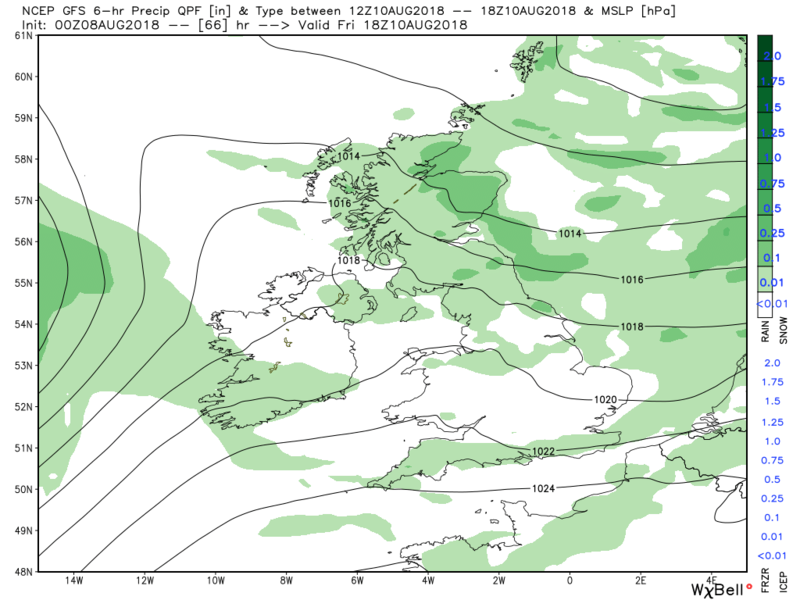 Thus a a bright and cooler day for all but the likelihood of frequent heavy showers, perhaps thundery, mainly concentrated in the west at first but spreading east during the day. 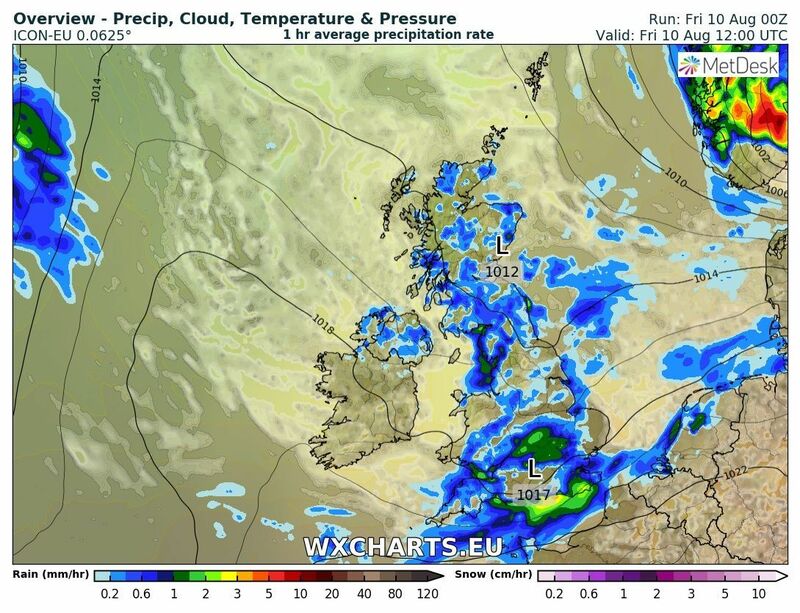 Within the flow there could well be longer period of rain where the showers coalesce. 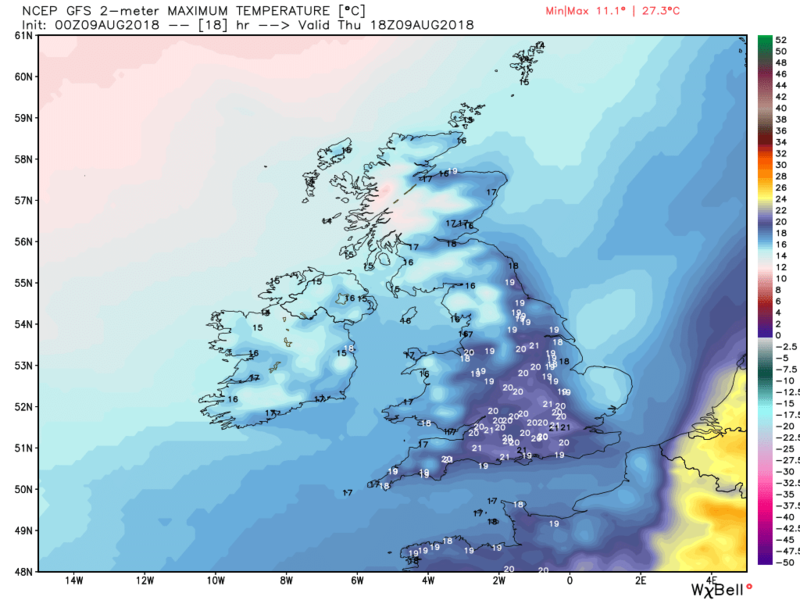 The showers will die out during the evening and overnight as a very transient ridge builds heralding a much cooler night for all and a bright start to Saturday. 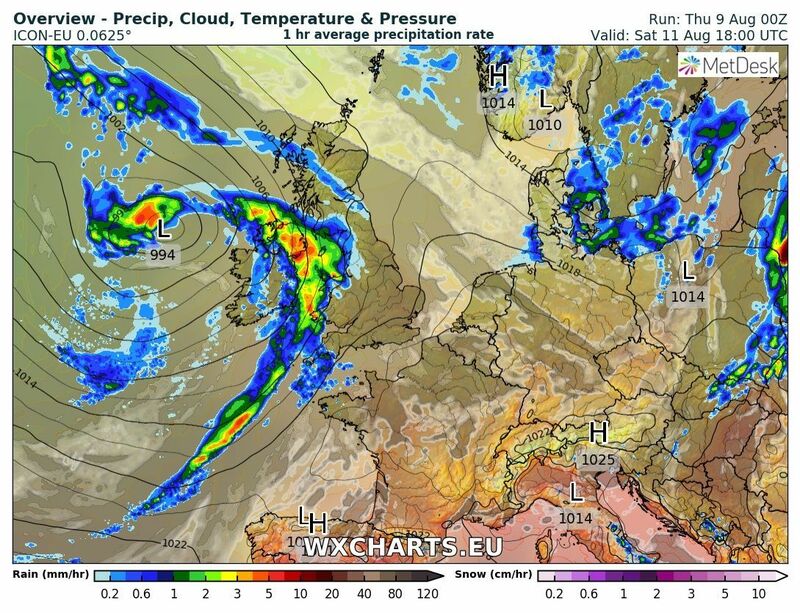 But to the west of Ireland an area of low pressure is getting organized and moving slowly east and a weak front associated with the system quite quickly brings cloud and some patchy rain into the south west in the early hours before the big guns bring more prolonged rain and strengthening winds arrive later in the day and move north east across the country. 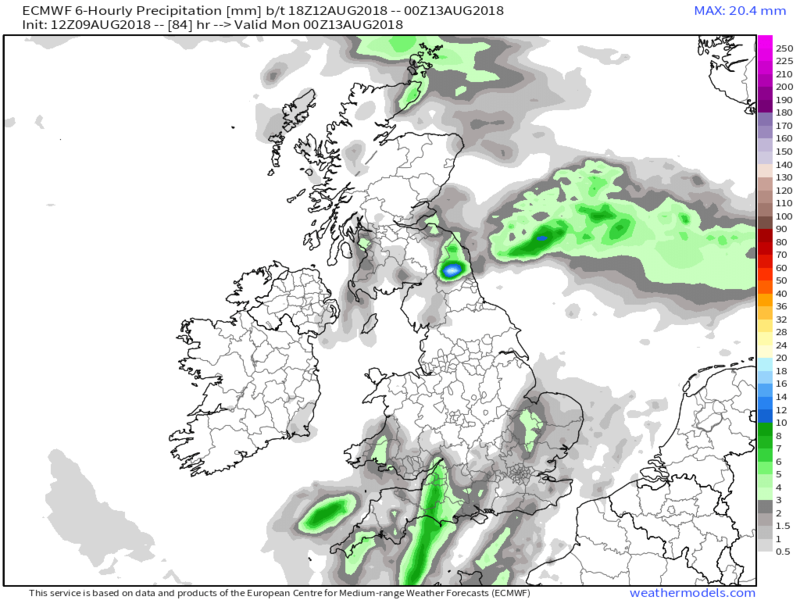 Much of northern, central and eastern areas will remain dry, certainly until late in the day. 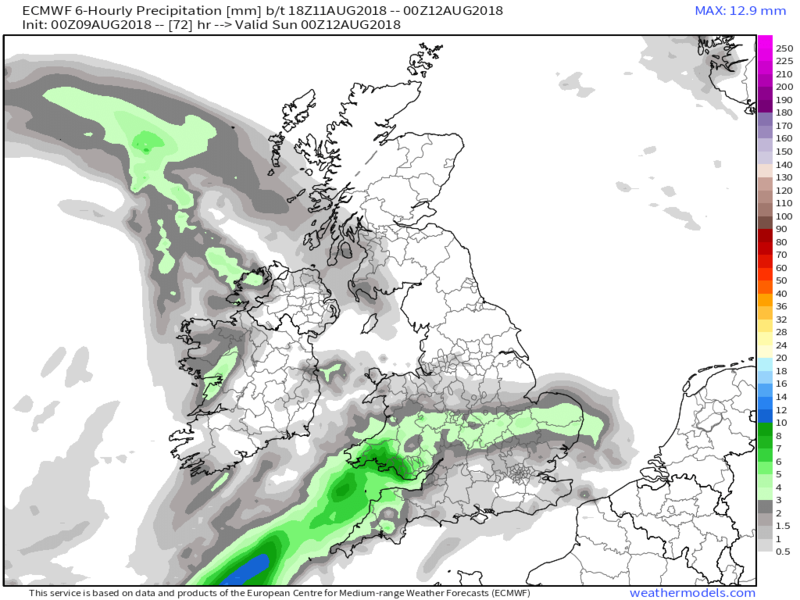 The fronts and more concentrated rain continue to traverse the country overnight and through Sunday morning before leaving much of the country in a brisk south westerly warm sector on Sunday which portends cloud and patchy rain, albeit becoming a tad milder. 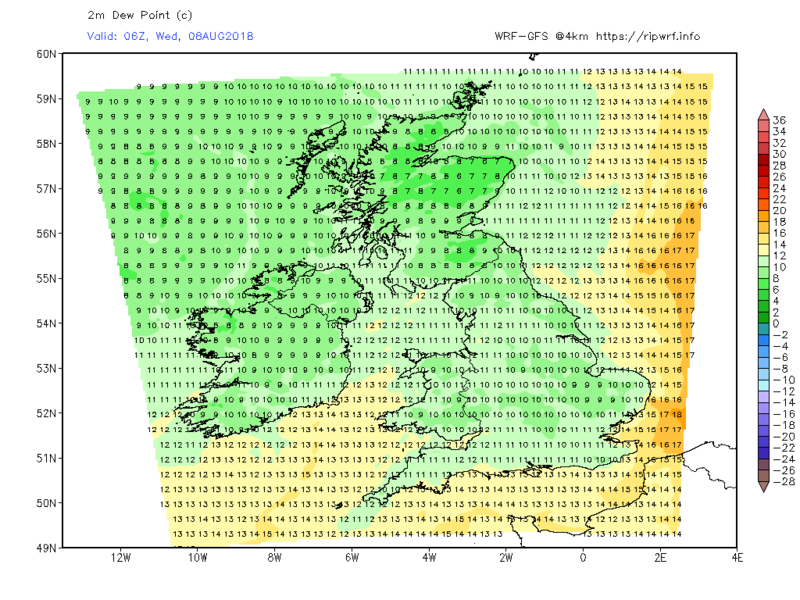 Clearer conditions later in areas where the cold front has passes through. 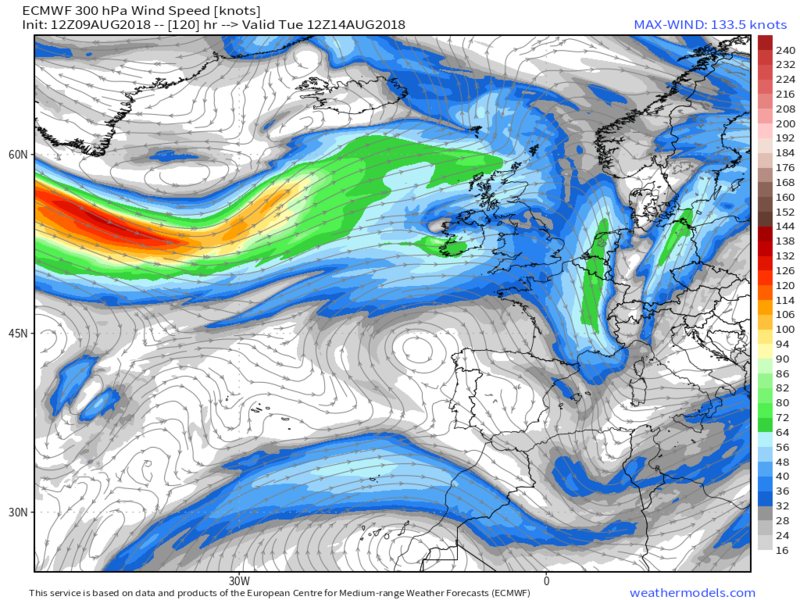 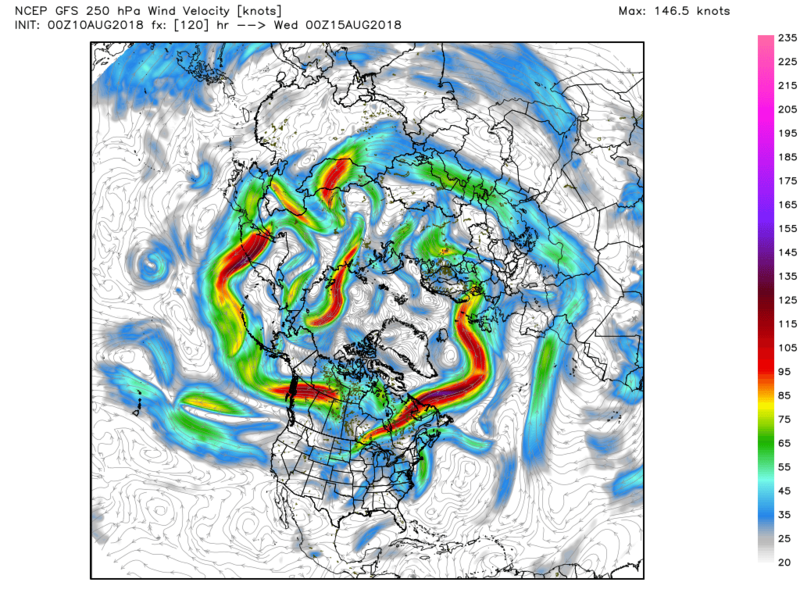 Frankly Monday dawns with a very messy scenario, best illustrated I feel by a quick overview of the fluidity of the Atlantic and the phasing of the warm/cold airmasses. 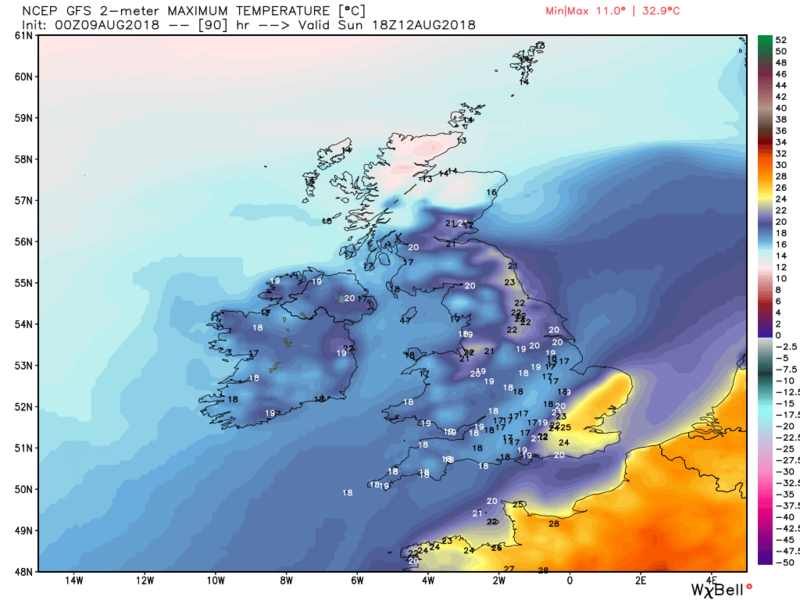 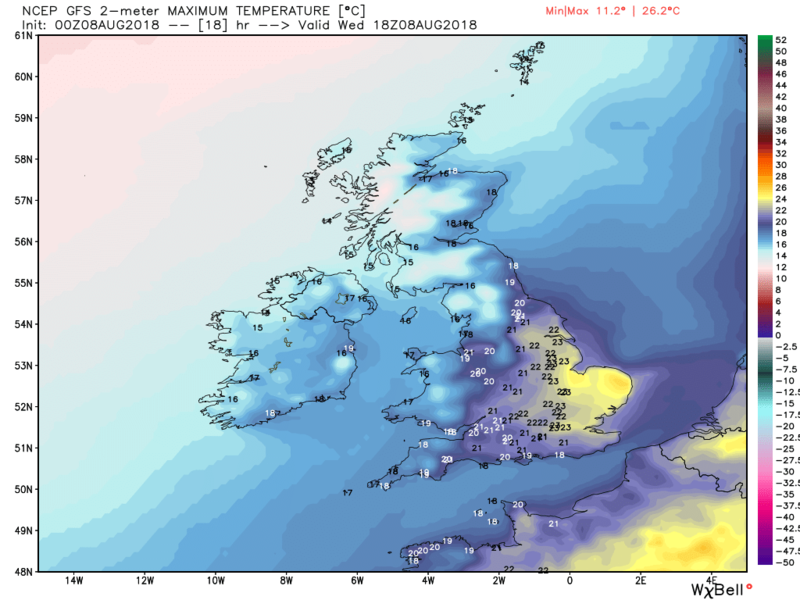 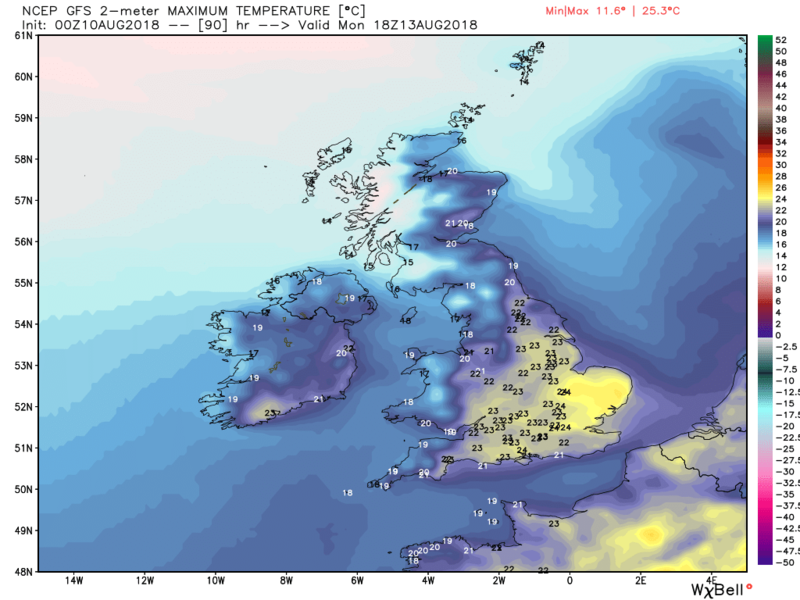 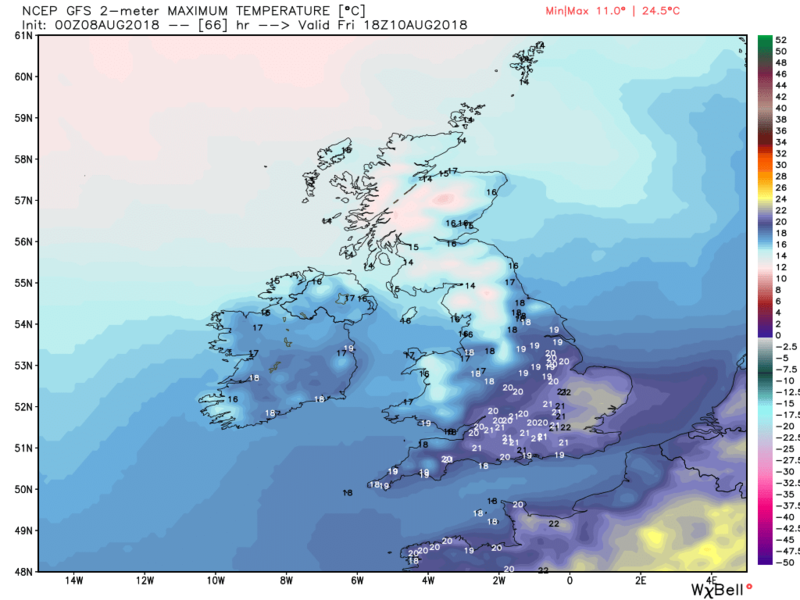 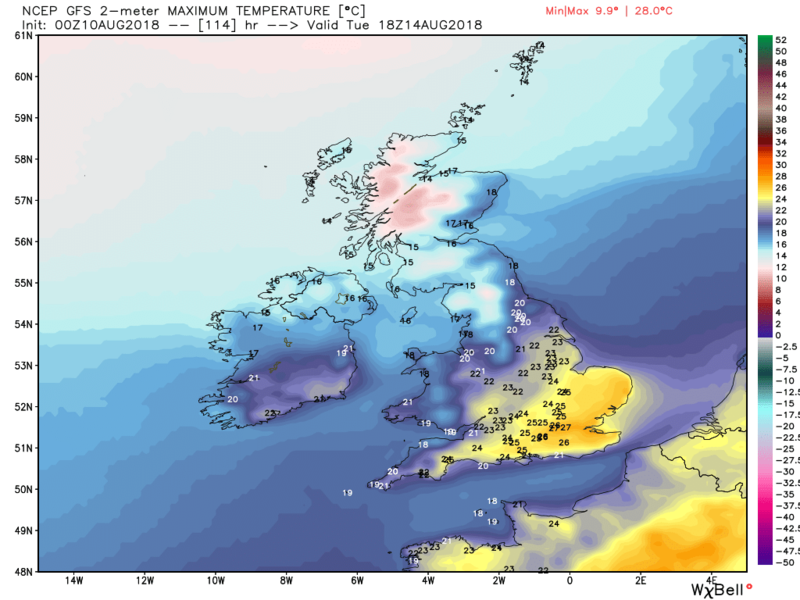 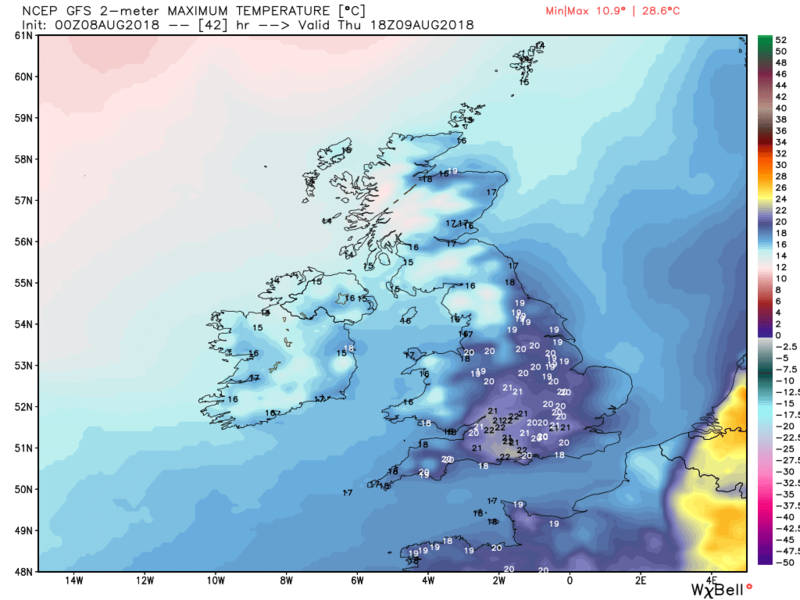 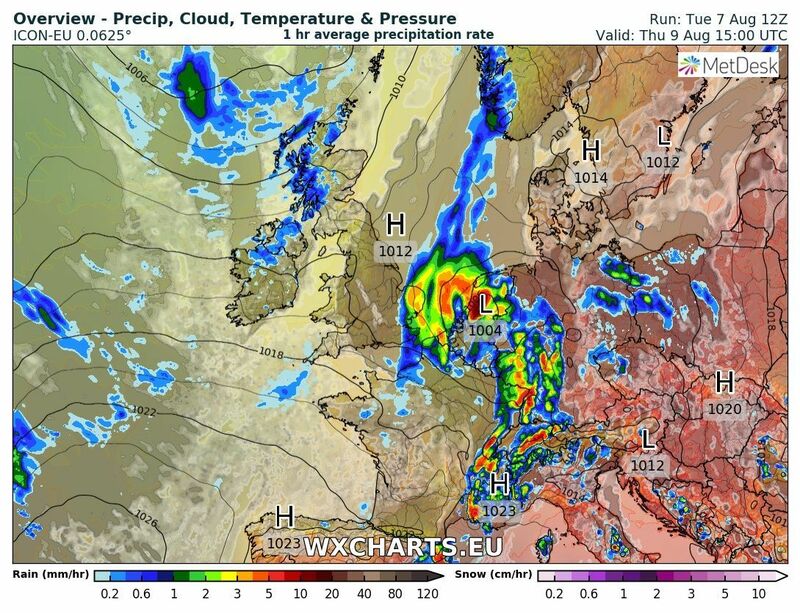 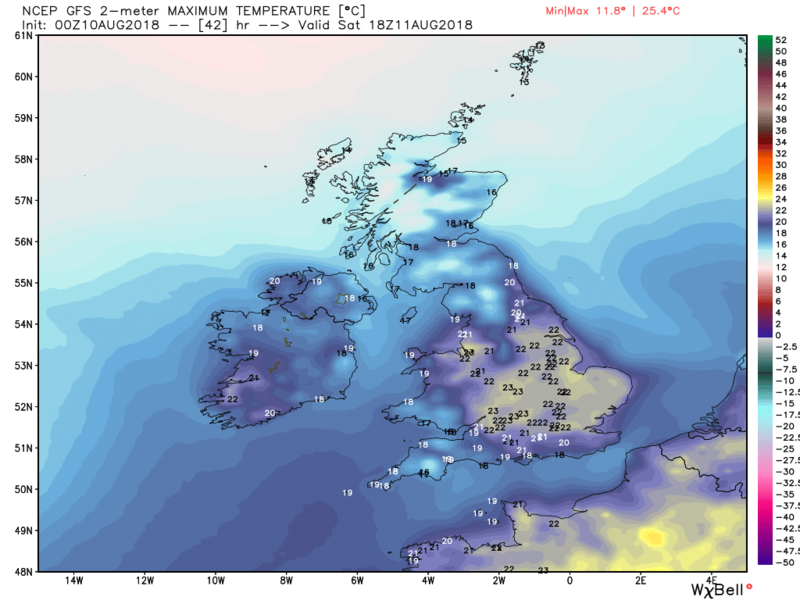 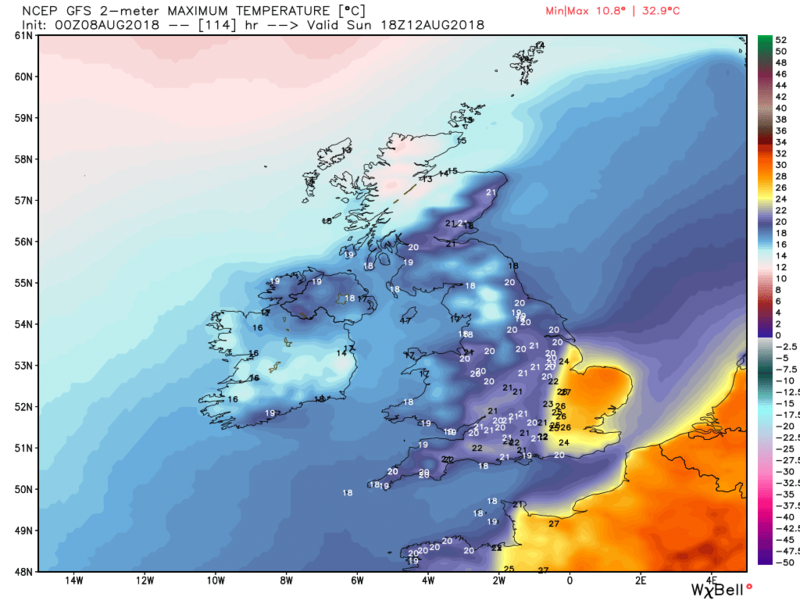 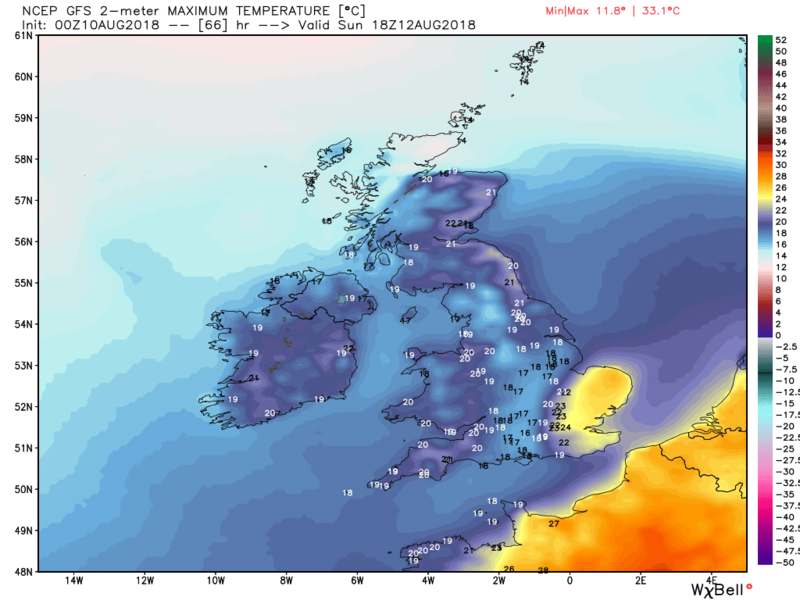 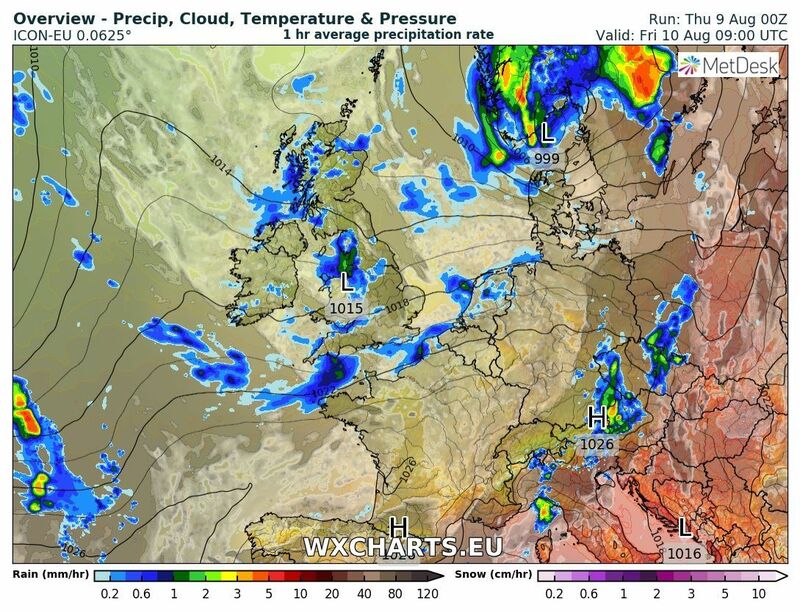 Which all boils down on Monday to another day of sunshine and showers over the UK as low pressure starts to give way to another transient ridge, with temps picking up a tad in the south east. 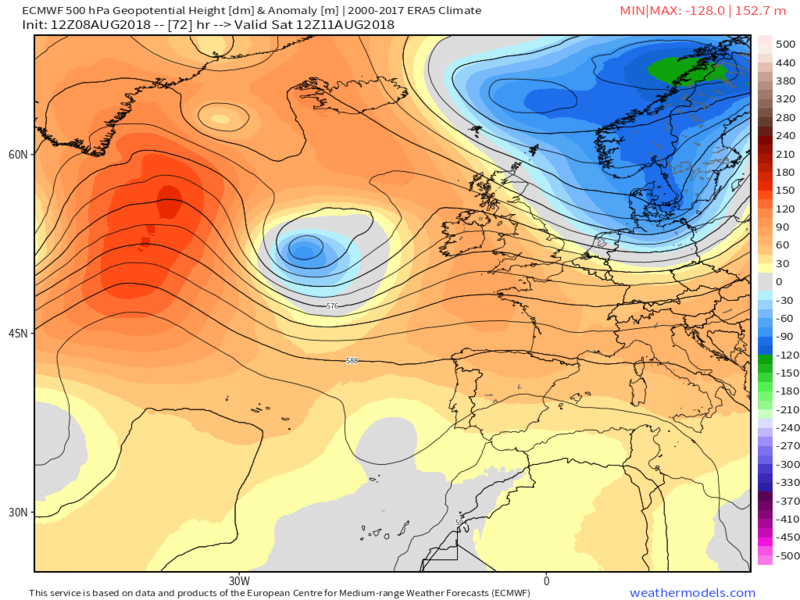 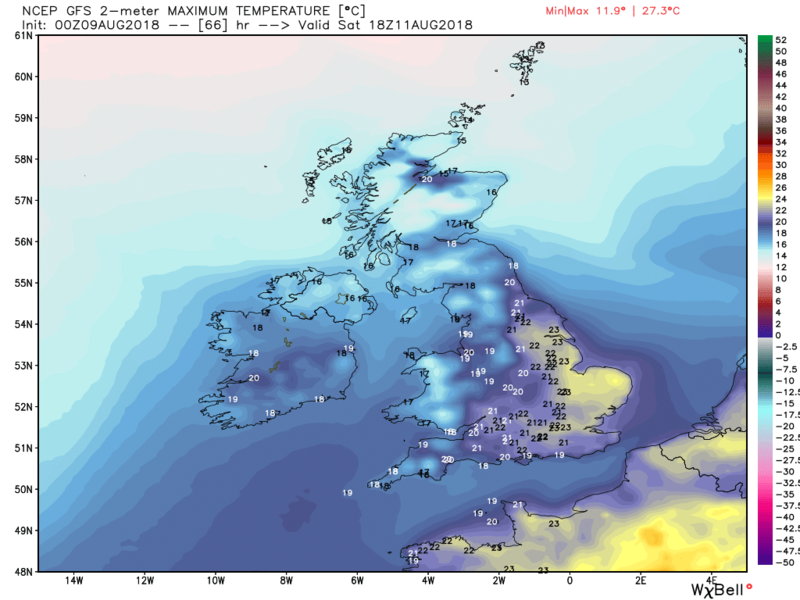 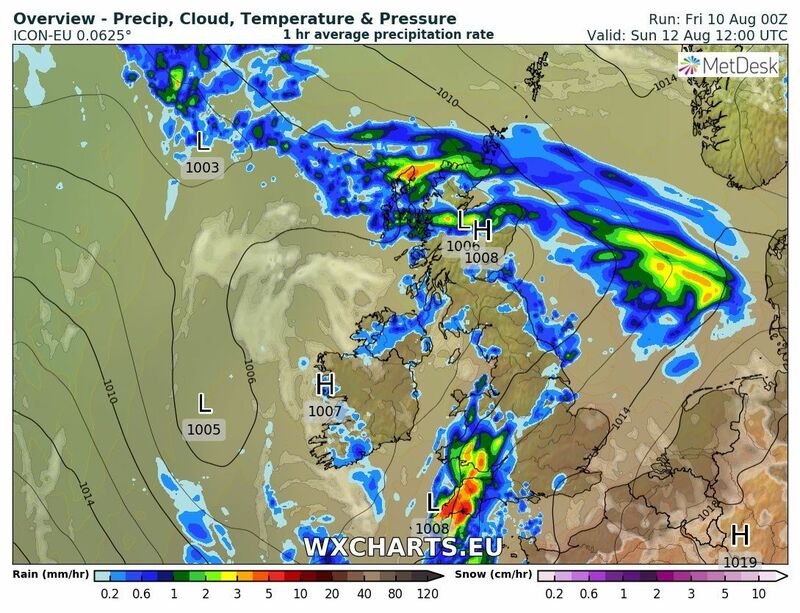 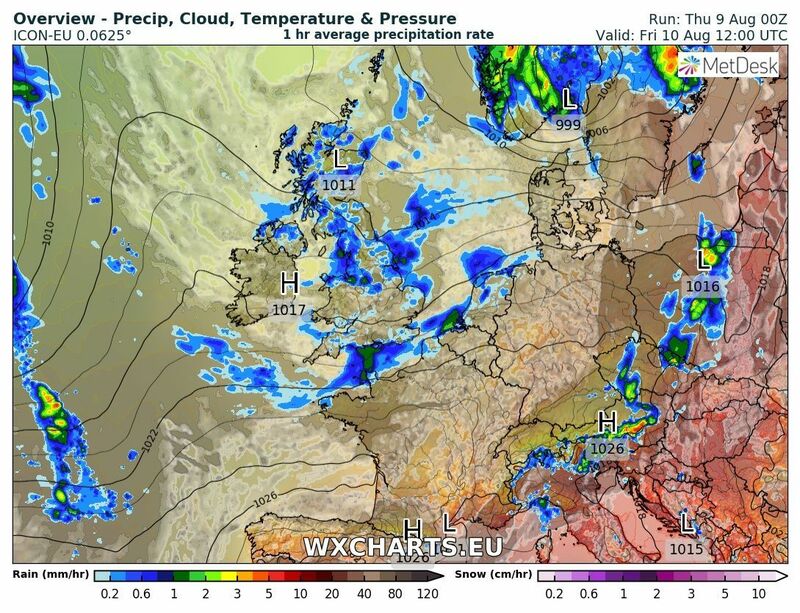 The ridge is transient because by Tuesday another frontal system has encroached northern areas bringing more cloud and patchy rain whereas further south, by marked contrast, a fine and quite warm day should ensue. 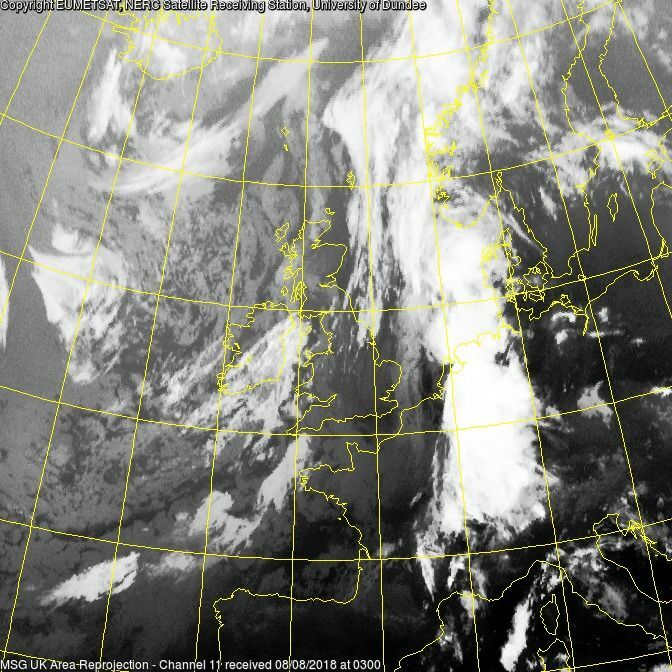 Some big Cu and hefty showers down here which is no big surprise looking at the 0600 geostationary. 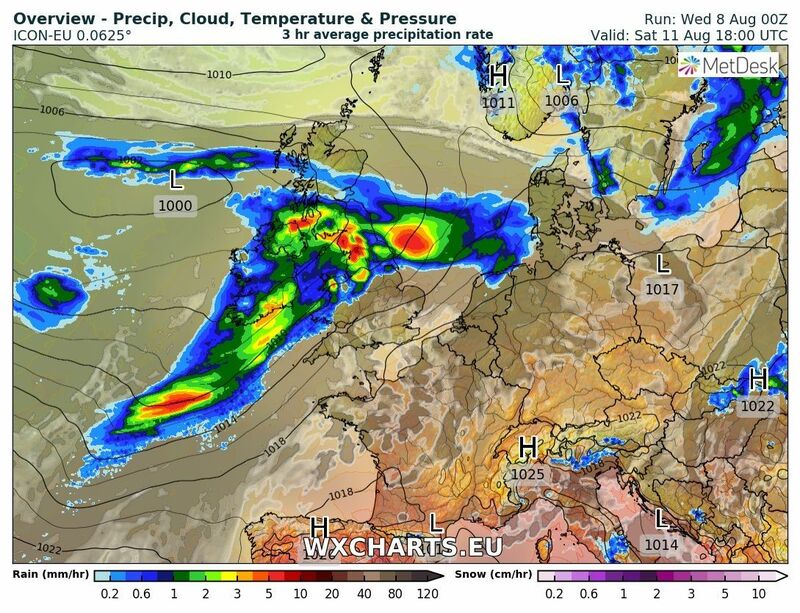 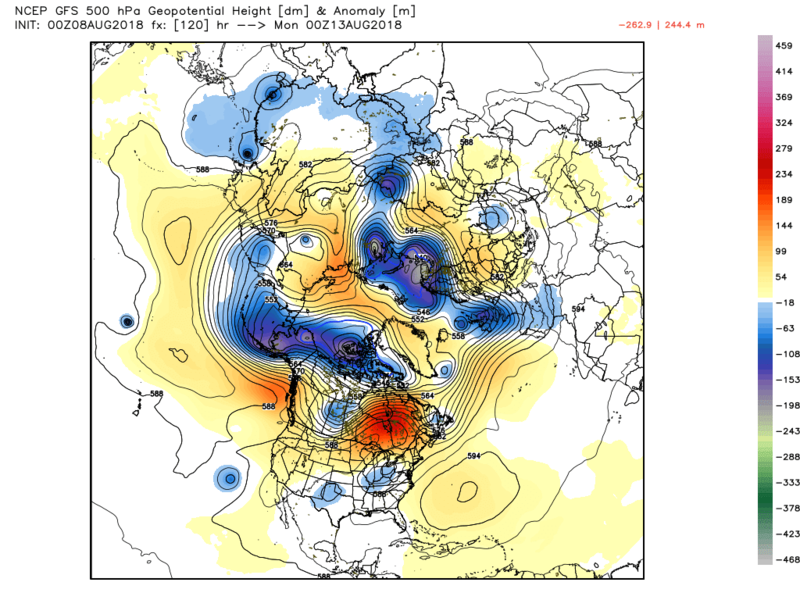 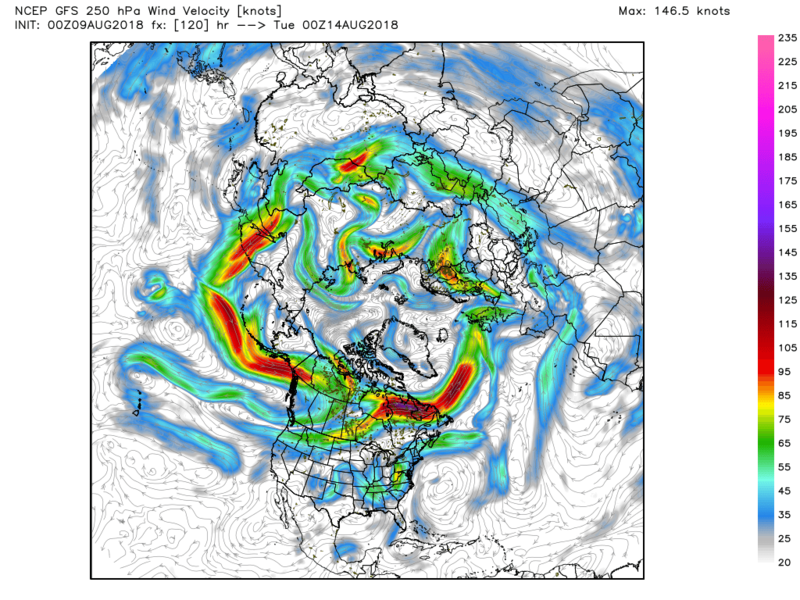 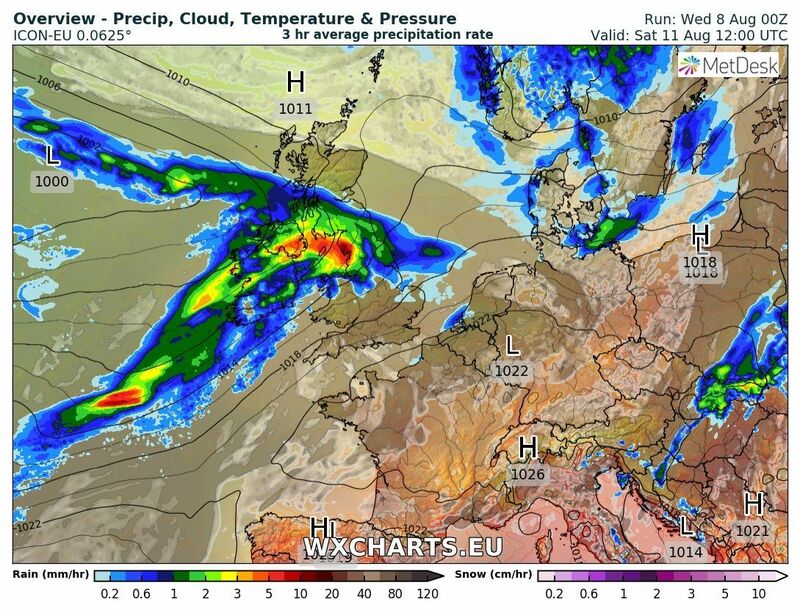 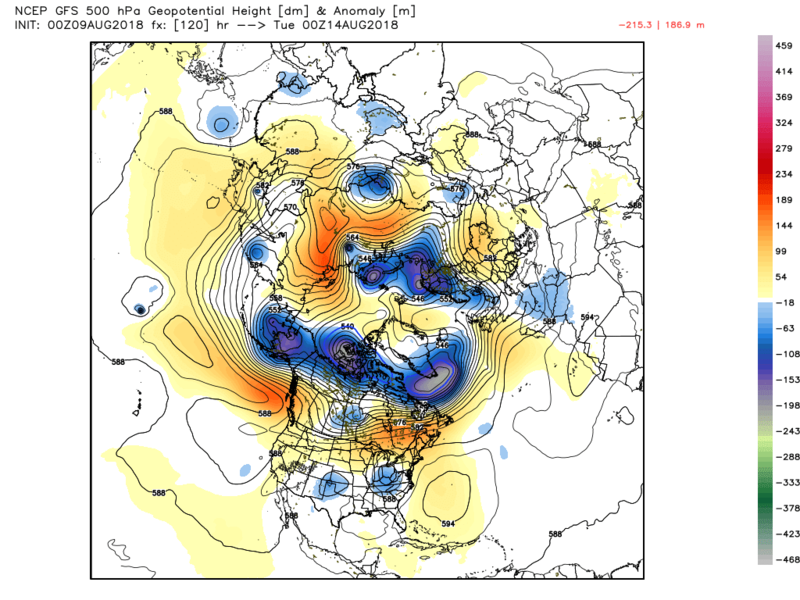 Also a trough to the south west?